Posted: March 5, 2019 in Fotos, Who,What,Where & When...? Davo just loved to compete- anywhere and everywhere. Apart from his four AGP wins he was adept on the dirt in Redex Round Australia Trials competition and in the hills. 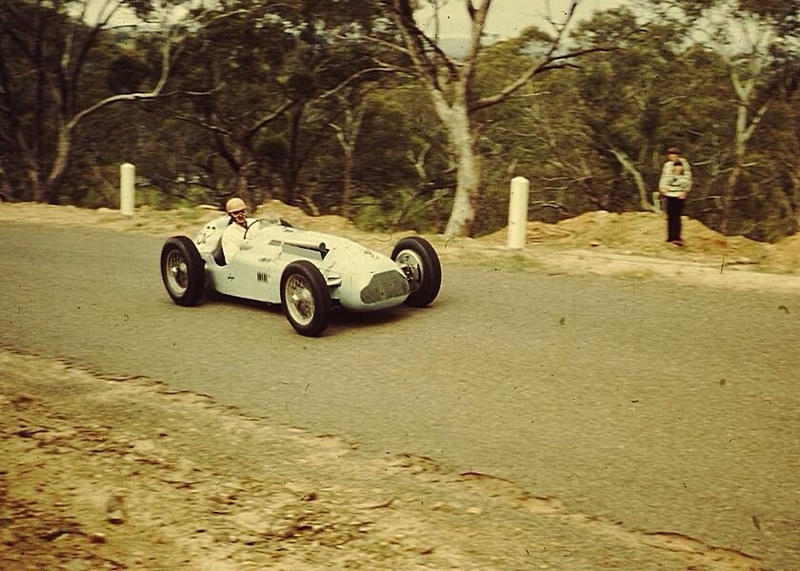 He won the Australian Hillclimb Championship thrice on the trot from 1955-1957 at Toowoomba, Bathurst and Albany respectively, in all cases aboard the Cooper Mk4 Vincent/Irving. This non-championship event was an easy one for the great man. Toorak to Maldon is a nice 150 km drive up the Calder Highway so would have represented a nice weekend away with the car and no doubt a few of his kids. The internet gives and gives in terms of photos seeing the light of day after decades hidden in boxes. 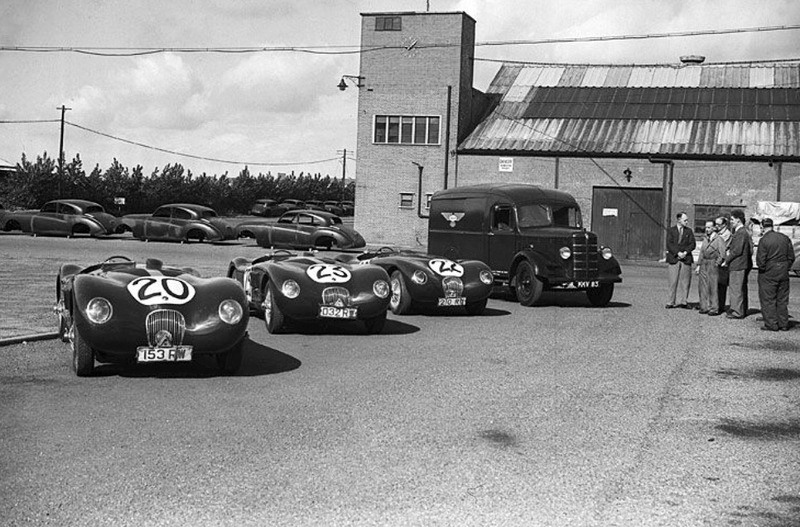 This wonderful batch were taken by a friend of Max Williams, he posted them on Bob Williamson’s amazing Facebook ‘Old Motor Racing Photographs-Australia’ page. In amongst hundreds of recycled touring car photos are some jewels, including this lot! 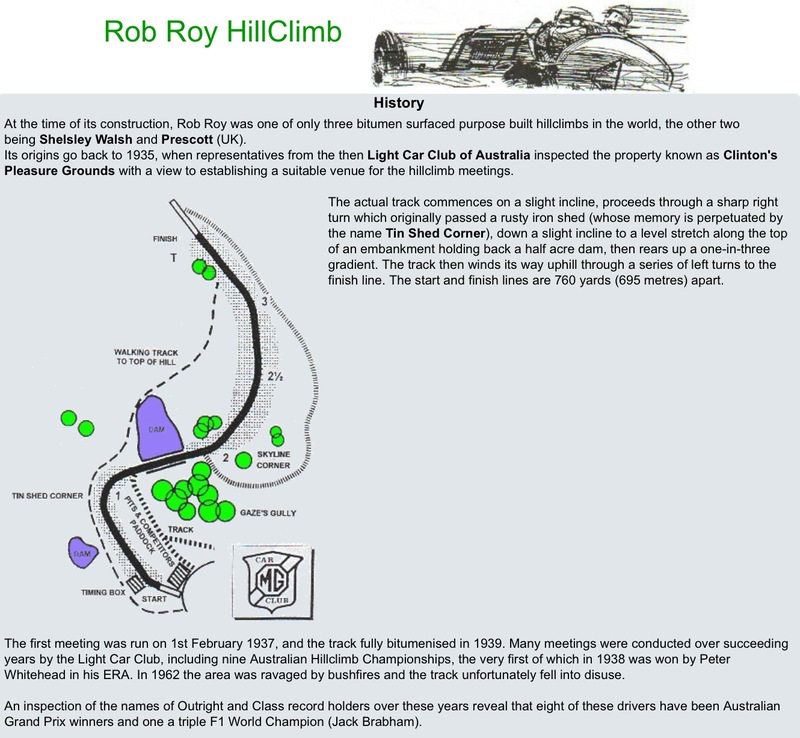 Bob King attended that day, it was ‘..the second hillclimb of the new era, the venue revived by the Vintage Sports Car Club of Victoria, with the event held on 25 October 1964’. 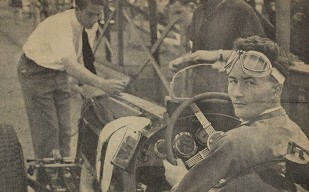 ‘Graeme Thomson raced the ex-Whiteford Talbot Lago T26C but ‘Doug was there and advanced the magneto by about half a turn and then did an electric run. In those days the finish was right at the top, and having finished my run i was privileged to see Whiteford sideways across the finish line at about 100 mph. Davo was pretty exciting also taking the FTD with a 50.34 seconds run’. 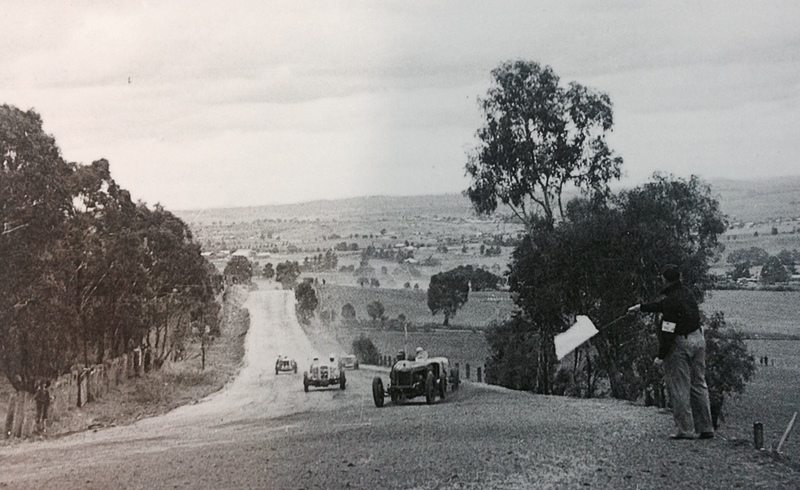 Ron Simmonds picked the ex-Whitehead/Jones/Phillips Cooper T38 Jaguar (above) as probably driven by John Ampt at Monks Corner, Templestowe Hillclimb, again in Victoria. 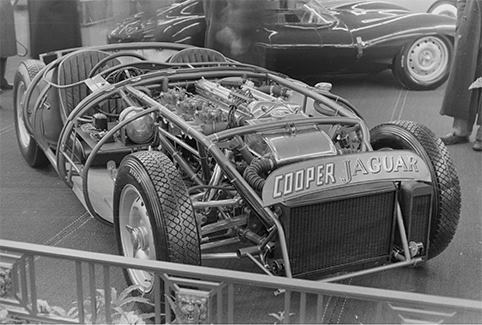 Enthusiast Les Hughes said of the car ‘One of three, the first and shown without body at the Paris Show. It was bought by Peter Whitehead and raced by he and his brother Graham at Le Mans and Dundrod in 1955. 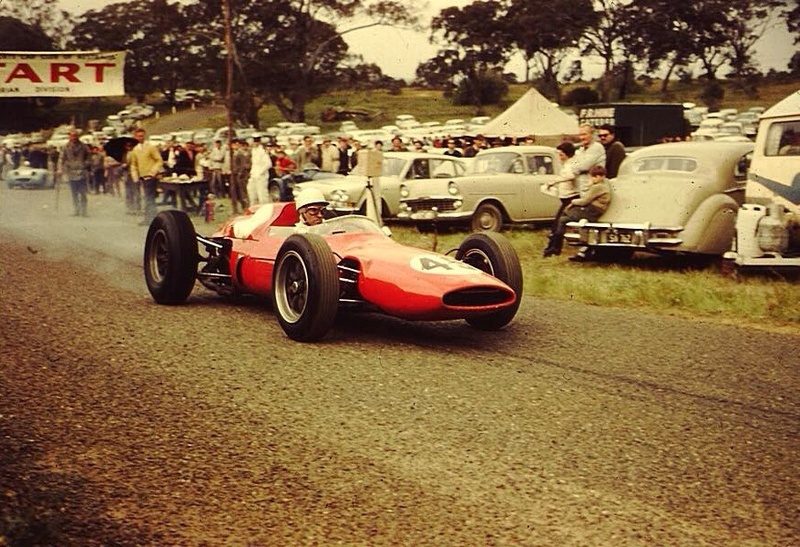 He sold it to Jones in New Zealand who made his Australian race debut in it at Albert Park’. 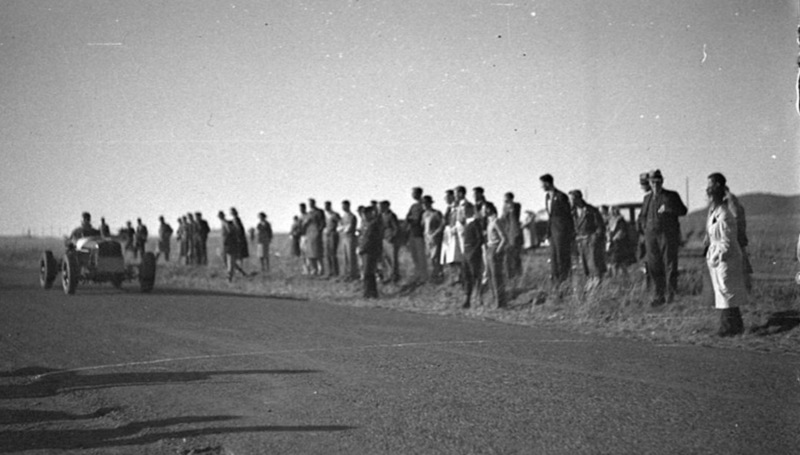 Pictured is the car below at Le Mans ‘…coming through The Esses and about to be passed by the ill-fated Pierre Levegh (Mercedes Benz 300SLR) who would die on this lap. The Cooper Jag retired’. Another Templestowe shot below , the corner at the end of Banana Straight, the wide loop hairpin onto The Shelf which then led up to The Wall. Who is it and what is it though? The article focused on a race meeting in May 1930, I had too many photos for that piece, the purpose of this article is to share them here. I’ve no idea who the driver or car above is but just love the silhouette of machine and driver against the backdrop of the Pacific Ocean. 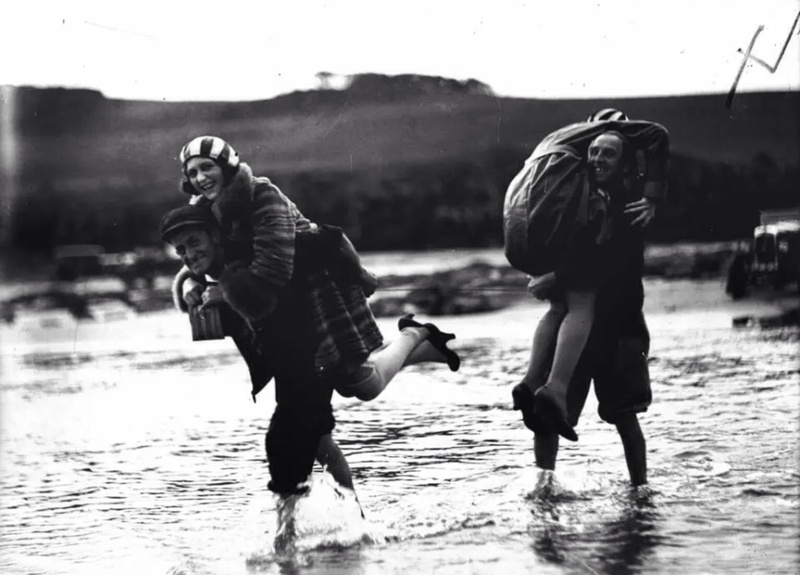 Its taken during the May 1930 meeting as the ‘track’ fights a losing battle with the tide. 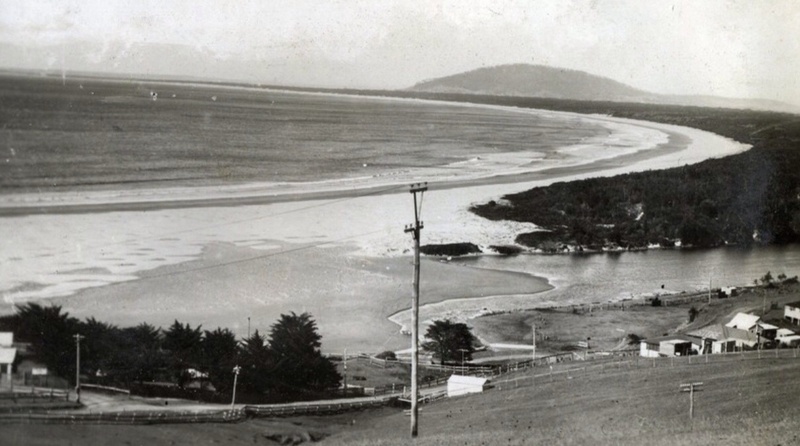 The photo above is of Seven Mile Beach and the little Gerroa settlement, it gives a sense of just how relatively quiet a place Gerringong was at the time. Gerroa River mouth at Gerringong. Upon leaving school Don Harkness became an apprentice in general engineering, aged 20 he was employed by JC Hilliers at Drummonye Sydney, by 1922 Harkness and Hillier Pty. Ltd. was formed. 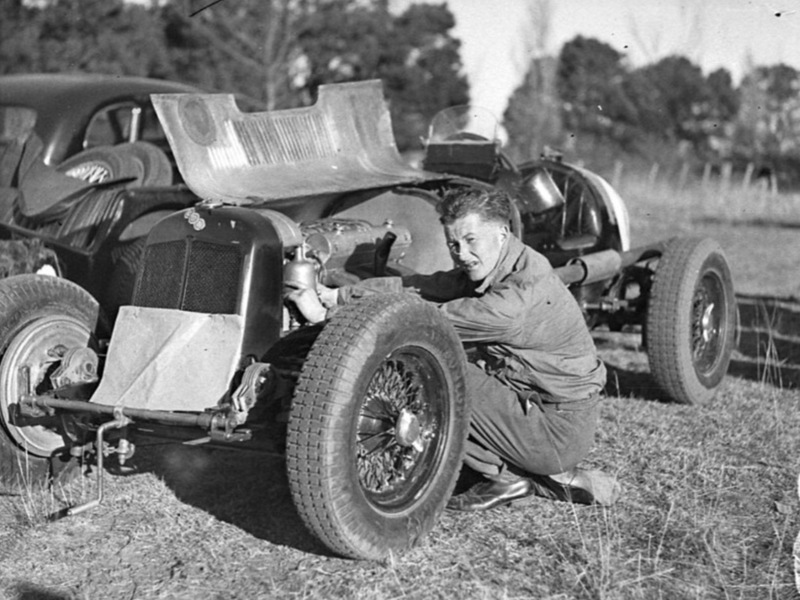 Don developed an interest in motor racing and imported a Willys Overland which was highly modified- ‘Whitey’ as the car was nicknamed won over 50 races at venues as diverse as the Maroubra concrete saucer speedway, the Penrith dirt speedway and on the beach at Gerringong. 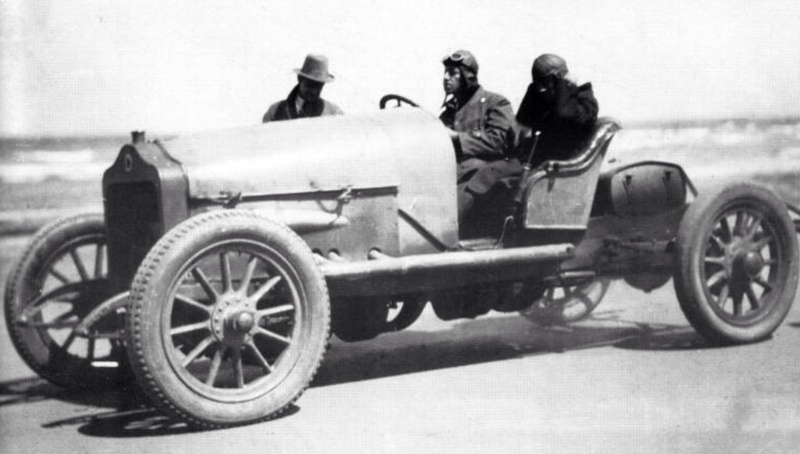 An offer of a fifty pound trophy to the first person to exceed 100 mph in Australia over the measured mile by the Daily Guardian newspaper led to Harkness’ use of FR Colbert’s Minerva chassis powered by a Hispano aero V8 engine- the car below won the trophy on 17 October 1925 at a speed of 108 mph. ‘The run was made under the worst of conditions seen for years with danger hidden in every sand hole. The car at one stage reached a speed of 142 mph and with such ease as make both Smith and Harkness confident of an ultimate speed of 175 mph’ the Sunday Times reported. 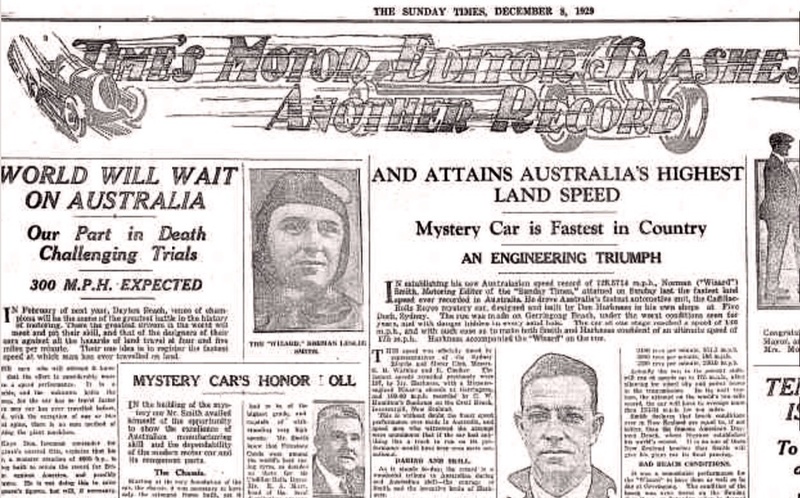 Don Harkness was approached by Norman Leslie ‘Wizard’ Smith and the former Lord Mayor of Sydney, Jack Mostyn to design and build a car to attempt the Australasian one mile and ten mile records. 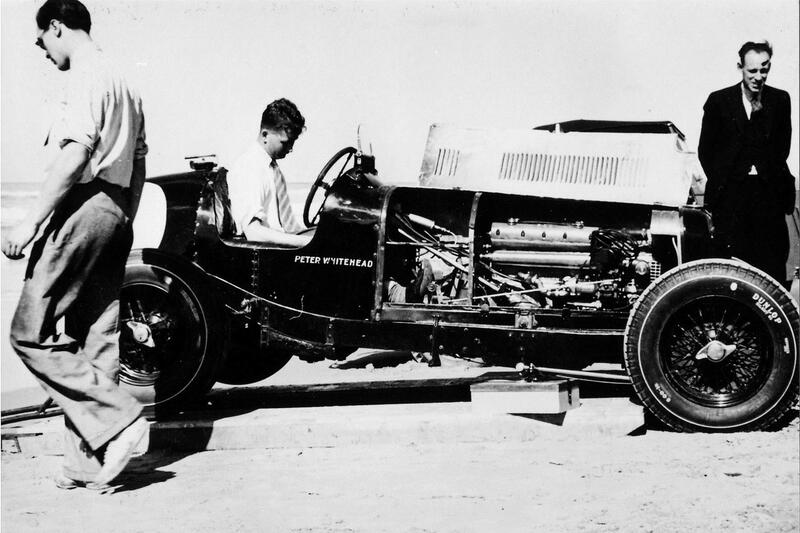 The result was the ‘Anzac’, a Cadillac chassis into which was inserted a Rolls Royce aero engine- as one does. 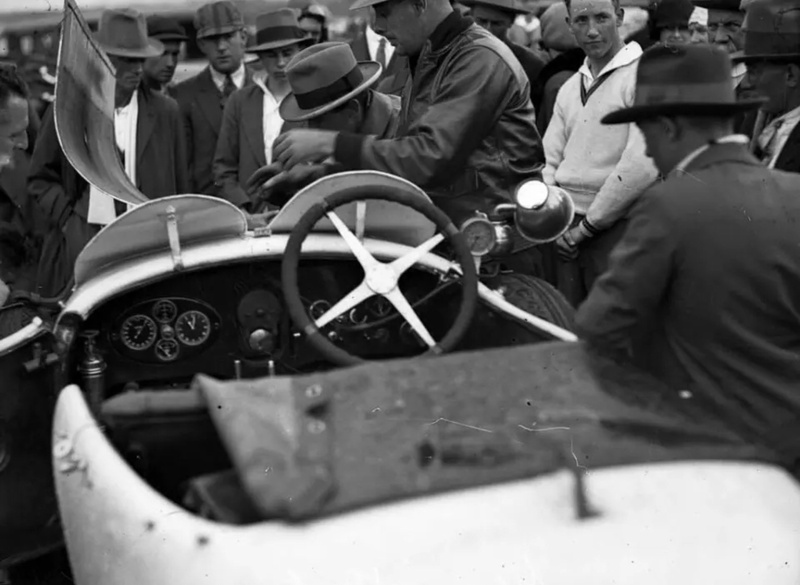 The liaison between Australian Speed Ace Smith- of intercity and circuit racing fame and financier Mostyn came about by chance when Smith came to Mostyn’s aid with a car breakdown. A series of discussions resulted in a determination to initially take Australasian Records and then with a second, more powerful machine, to take on the world. Harkness was well known for his engineering and driving prowess to Wizard- Harkness had an amazing track record by then in both automotive and aero engineering which is a great story in itself, so it was a natural he turn to the Harkness and Hillier concern to design and build the first car, christened ‘Anzac’ in memory of the Australians and New Zealanders who lost their lives in the Great War. 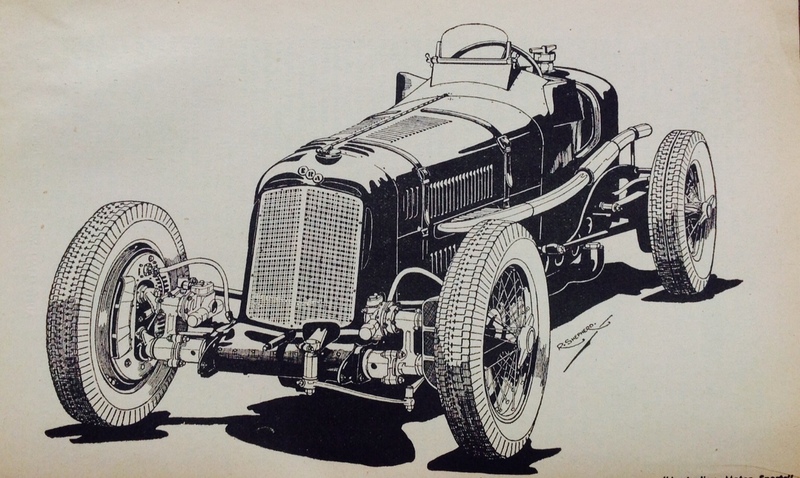 The basis of Harkness’ design was a modified and strengthened Cadillac chassis- ‘Harkness chose a Cadillac and found the stock material so good, that he retained the frame, the (3 speed) gearbox assembly, the wheels, final drive, radiator and strengthened the steering by fitting a special chrome steel drag link in one piece’. The Cadillac chassis details are unclear, but in 1928/9 they were made in two wheelbases- 140 and 152 inches, the former the standard and the latter the ‘semi-commercial’ lenghth for hearses and ambulance use, both had the same track of 56/58 inches front/rear. The standard engine was a 341cid side-valve, cast iron V8, the gearbox was a 3 speeder, brakes mechanical and rear axle fully floating with spiral bevel drive. Wheels were ‘ordinary stock 33 by 5 inch high pressure cords’, ‘on the trial run at Richmond they stood up to 121 mph’ with race tyres to be used in New Zealand with its higher expected speeds. The beast was about 20 feet long, had a wheelbase of 11 feet and a track of 4 feet 8 inches. The motor (variously described as both an Eagle series 8 and 9) was the last in a line which first saw use in 1915- the 320-360 bhp, SOHC, twin-plug, 20 litre, 60 degree, twin Claudel-Hobson carbed V12 engine was acquired as war surplus from the RAAF. Harkness modified it to be able to run at higher revs of 3000 rpm rather than the usual 1800-2200 rpm. The engine had a bore / stroke of 4 1/2 / 6 1/2 inches – 1239 CID or 20.32 litres. The car was constructed in the Harkness and Hillier, Parramatta Road, Five Dock, Sydney workshops with local firm Prophets making the ‘streamlined’ body, which no doubt in style was a nod in the direction of other LSR cars in existence at the time. 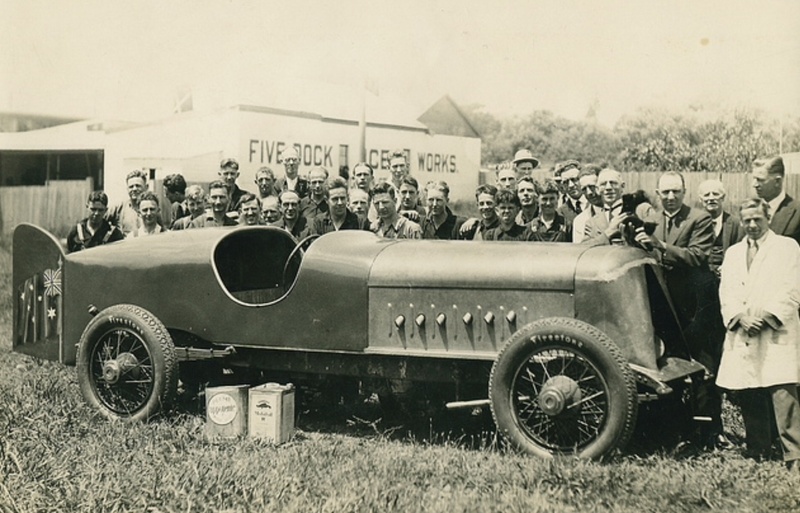 The LSR in 1929 was held by Henry Segrave’s 930 hp Napier Lion engined ‘Golden Arrow’ at 231.362 mph- well out of reach of Anzac’s maxima of circa 175 mph- but the machine was still good for local record hunting and as a ‘proof of concept’ to build the next car designed to achieve the world record. The radiator was at the front, the cockpit cowled around the driver ‘who was insulated from engine heat, flames and fumes’ by steel bulkheads and flooring. The mechanic was left well in the breeze, the body then tapered in towards the rear and had a neat stabilising tail at the very back. The fuel tank was aft of the driver and the oil tank behind the rear axle. The car no doubt looked stunning in its gold, lacquer paint. 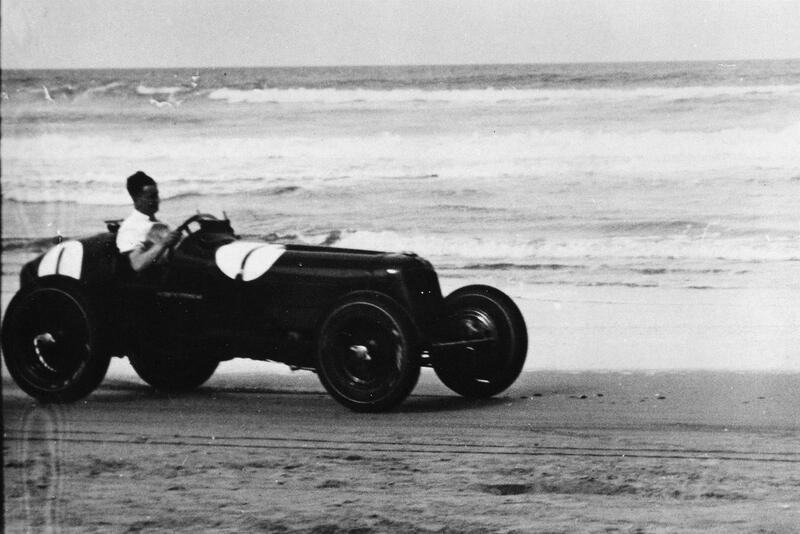 The Australasian Record attempt was to take place at the Ninety Mile Beach in New Zealand in early 1930, but first the car had an Australian Record to set, and needed to prove it was fit for purpose before being shipped ‘across the ditch’ (Tasman Sea) from Australia to New Zealand. Anzac was taken by trailer from Five Dock to Gerringong where the team set up camp in late November 1929. ‘Conditions were so bad on the Saturday that Smith postponed his attempt but were even worse on Sunday. Heavy seas had pounded the beach for days and water rose as far back as the trees, 200 yards from the normal waterline. This had the effect of bringing thousands of tons of loosely, badly-knit sand on to the part of the beach used for racing. 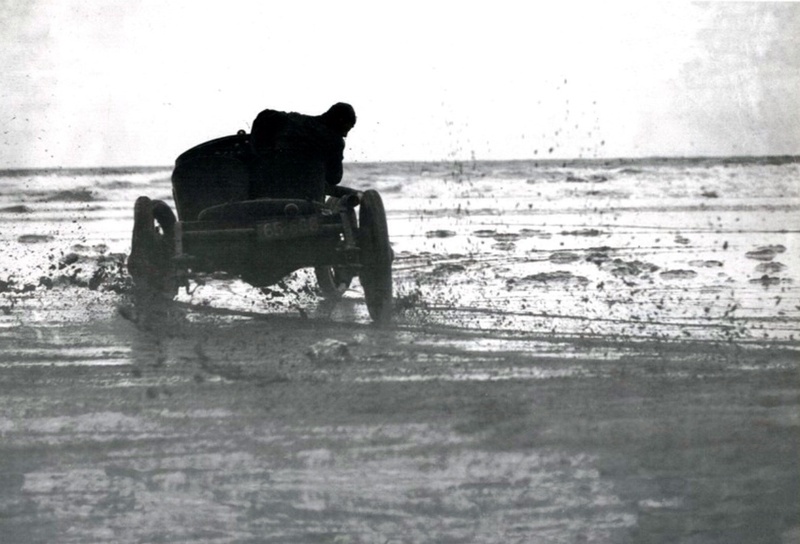 The line was covered with seaweed and ruts and hollows along the course and made the driving dangerous. On the Sunday, the Wizard and Harkness looked over the beach at dead low tide and decided to give the car a trial. There was but a tiny stretch of the surface good enough for racing, just about three quarters of a mile long’. 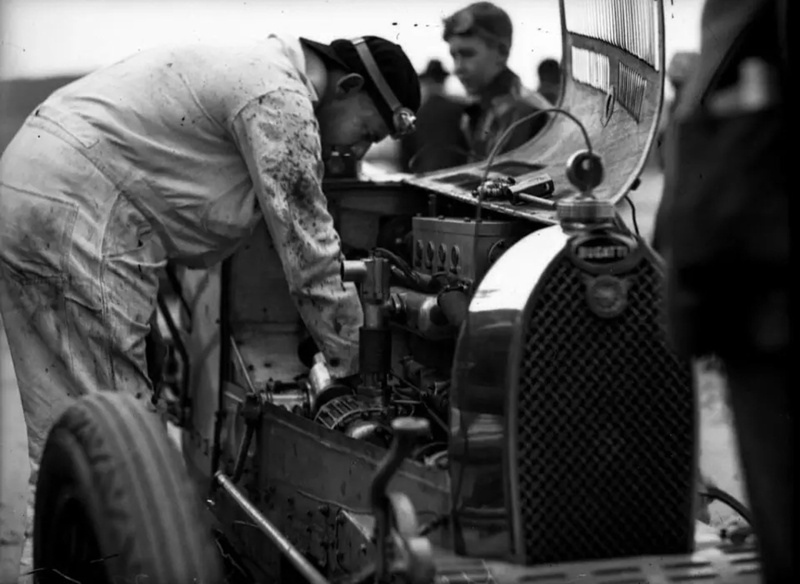 After being carefully made ready the Rolls engine was fitted with soft plugs for a warm-up run of the engine after which 24 race, or hard plugs were fitted. 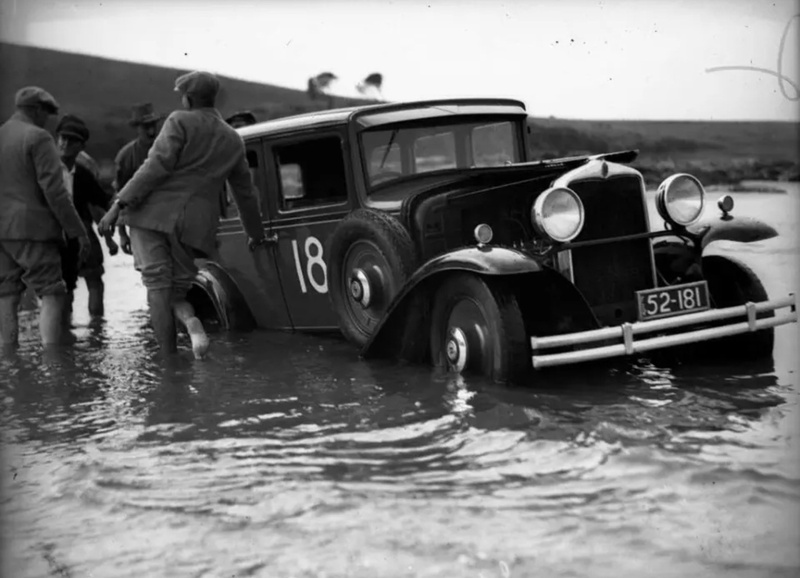 The car was fuelled, checked over for the umpteenth time and then Smith and Harkness jumped aboard. ‘The final quarter mile was marked off, and the car took a run of only 800 yards before entering the timing strip. “From the start we accelerated to 110 mph where we hit the starting line” said Wizard. “Just before we did nearly 3000 revs in second gear, and I changed a few yards in front of the line. We were doing just about 110 mph then, and in the next few yards I could feel her winding up. She surprised me. I’m convinced Don has built me the fastest car in Australia. The old bus will beat all the Wapitis that overflew. I’ll guarantee that she has more speed than anything else in Australia, or a plane”. Harkness on this side of the car is leaning well forward- I wonder if that is due to his seat or trying to get a better fix on the perilous nature of the beach? 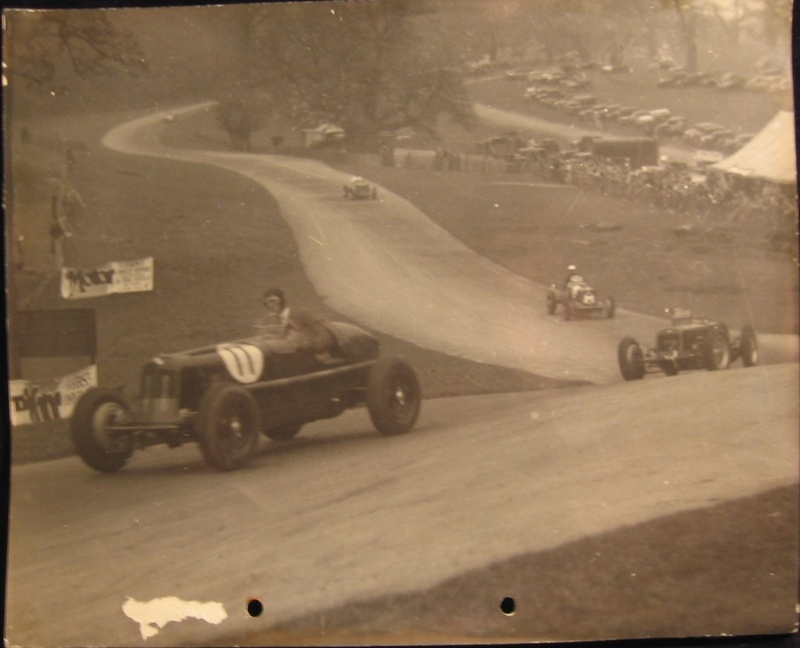 Suppliers cited as providing components for the car were AH Prophet, the body, Vacuum Oil Co the fuel and lubricant- ‘Plume Spirit’ and Mobiloil B.
EA Marr provided the Firestone tyres with Harry Taylor of Advanx Ltd having them ‘treated and scientifically trimmed and balanced for speed’. WT Adams of Motor Ignition Ltd supplied an ‘Ajax’ battery to start the giant motor and F Reed supplied Personne-Reed double-acting hydraulic shock absorbers. ‘The beautiful finish in gold’, was supplied by Bergers Ltd, using the famous ‘Opex’ lacquer. John McGrath Ltd, agents for Cadillac provided the chassis. 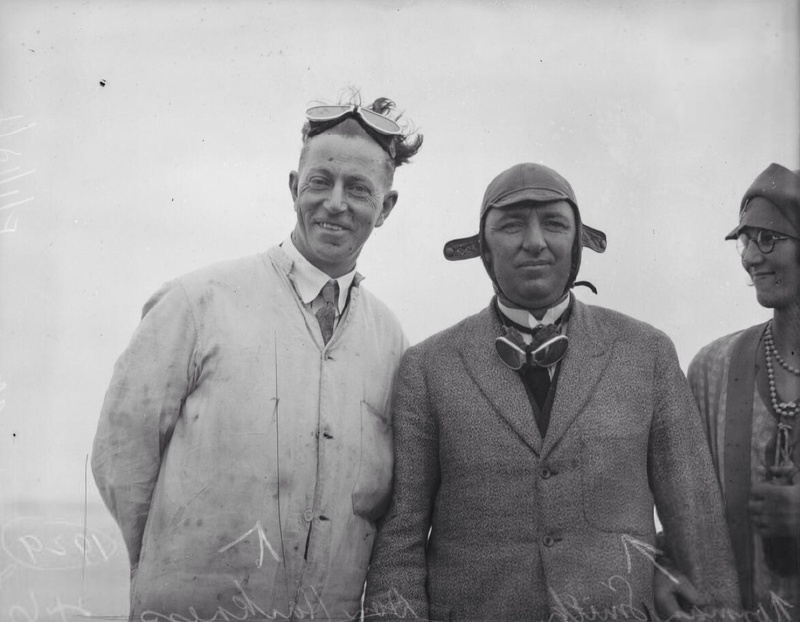 Taken to the Ninety Mile (Kaitaia) Beach Smith and Harkness achieved a two-way average of 144.037 mph on 11 January 1930. Days later they attempted the 10 Mile Average achieving a one way speed of 148.637 mph- better than the record then held by Leon Duray’s Voisin of 135.333 mph and were told that because of the distance a return run was not necessary. This was subsequently established to be not the case with the record being unrecognised given the lack of a return run and the antiquated equipment used to time it. 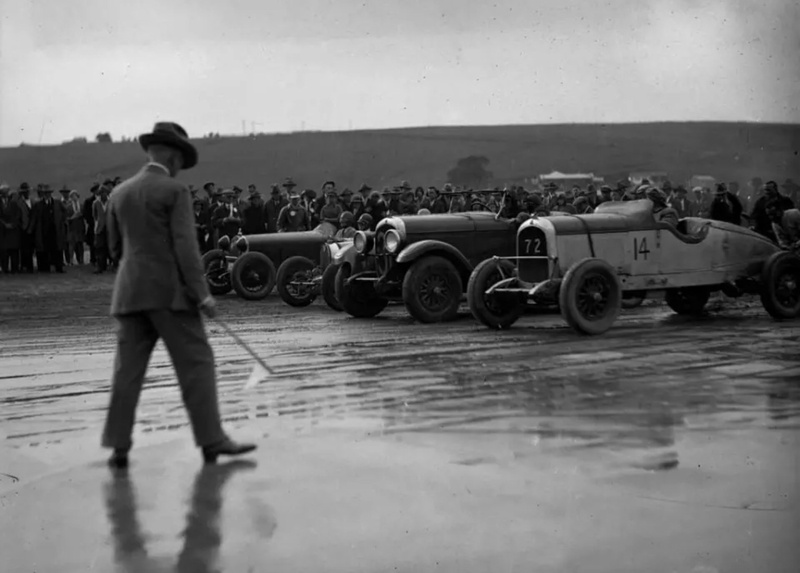 It was a very soggy raceday for both the racers and the specators, only about 300 hardy well rugged up spectators turned up to see Bill Thompson win the ‘Fifty Mile Handicap’ feature race in his Bugatti T37A, a car he had used to win the Australian Grand Prix not so long before. 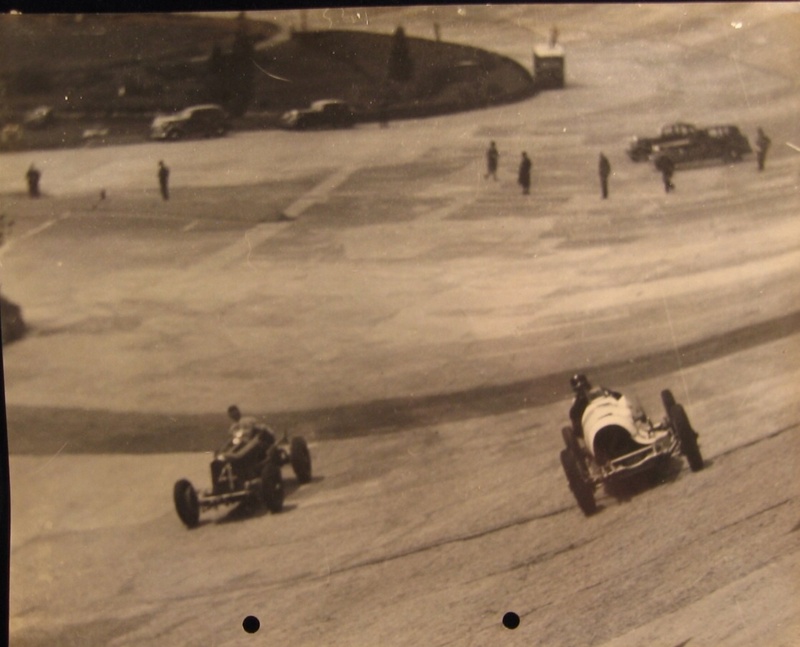 The grid above comprises two Chryslers to the left- the #72 E Patterson and HJ Beith Chrysler Sports with Charlie East’s Bugatti T37 on the right. 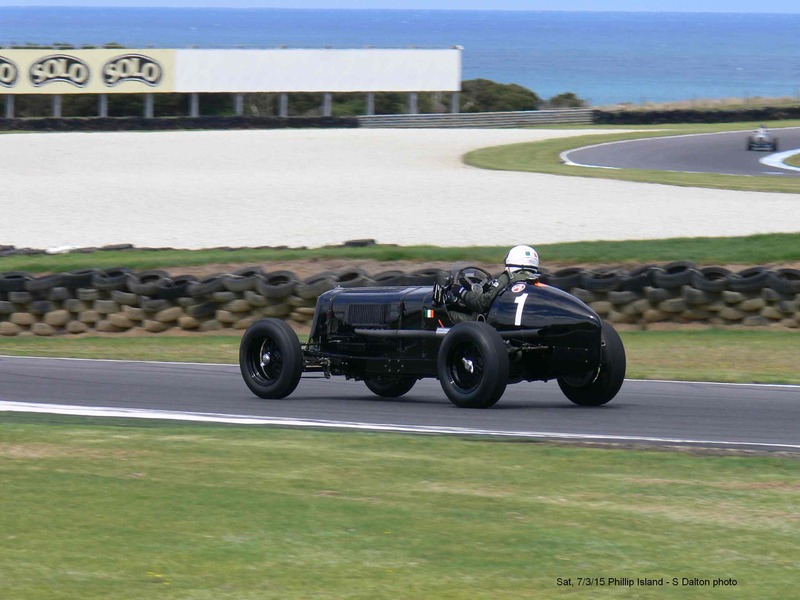 E Patterson’s 4 litre Chrysler on the turn around the flags which mark out each end of the course. Fine touring cars in their day. 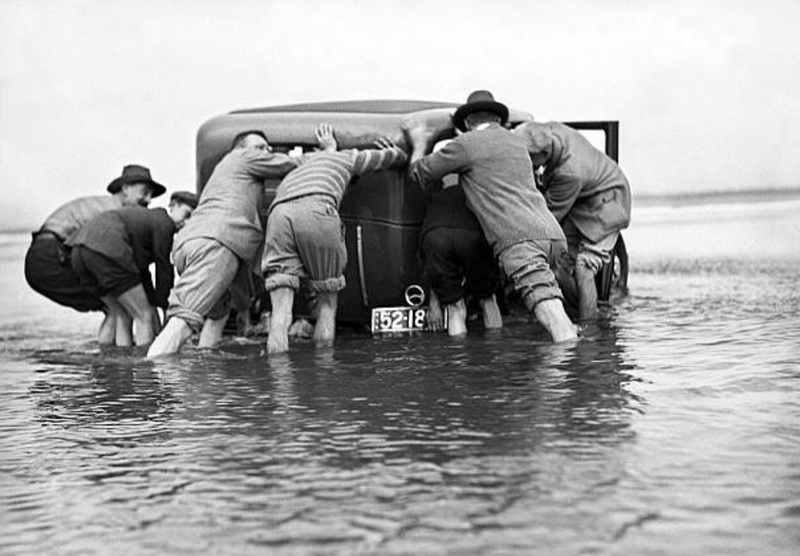 The light weight of this Morgan made rescue from the rising waters a good deal easier than more conventional and heavier machines! The race meetings were as much social, society occasions as they were motor racing so there were never any shortage of ladies about. The May meeting is well served by photographs given the presence of a staff photographer from the Fairfax/Sydney Morning Herald. Lea-Francis was entered by Mrs JAS Jones and raced by RG Potts in the 50 Mile Handicap. 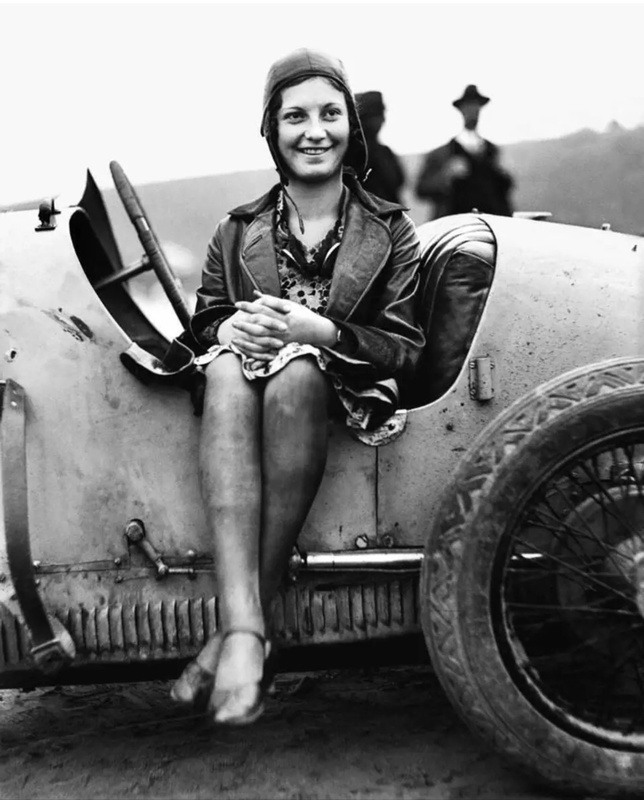 Speaking of Mrs Jones, here she is with riding mechanic aboard her rather peachy Alfa Romeo 6C1750 Zagato, one of Vittorio Jano’s finest, I wrote a feature about this wonderful machine a while back. She didn’t have a great meeting after winging’ a mechanic who strayed into her path having crossed the finishing line in one of the events- breaking his leg. In amongst all the fun there was some serious motor racing for the top-liners of the day. 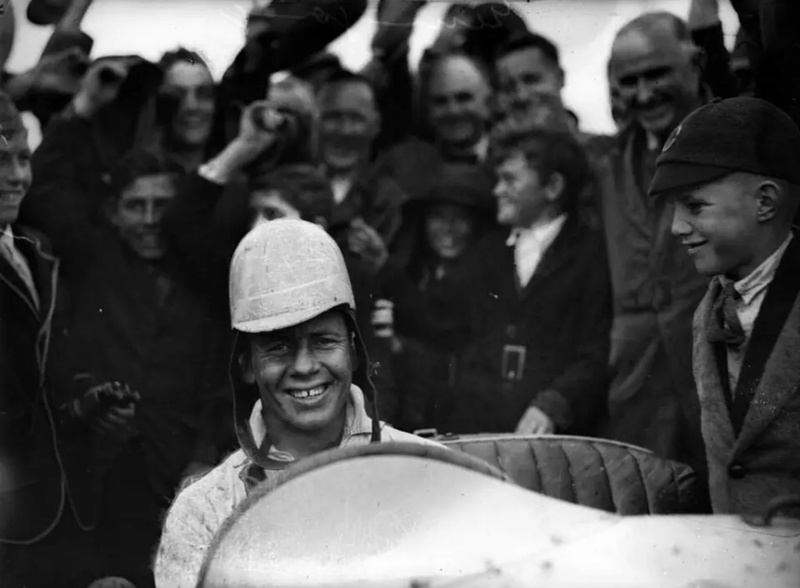 Three time Australian Grand Prix winner- and just back from Phillip Island having won the 1930 race, Bill Thomson raced the same Bugatti T37A and won the feature event of the weekend, the Fifty Mile Handicap. 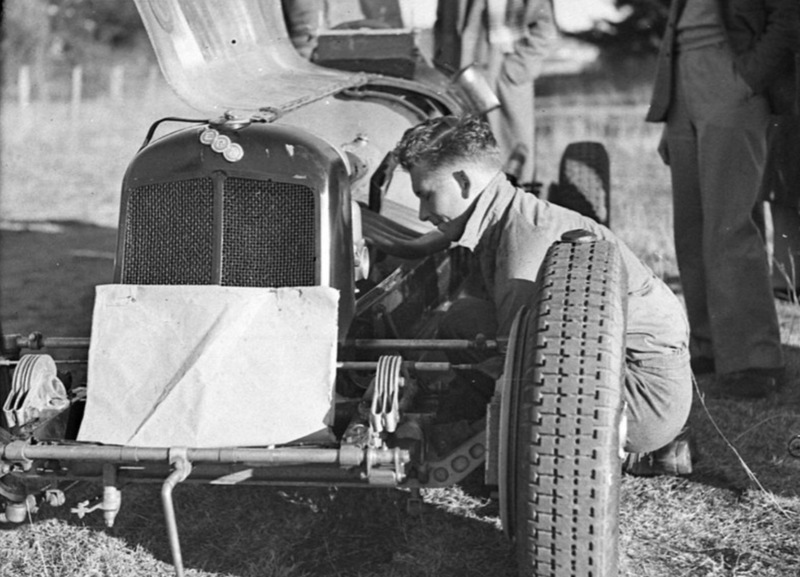 In the photo below his mechanic is readying his mount- that is a Light Car Club of Victoria badge on the radiator. Thomson was every schoolboys idol of the day as this photograph below shows- the look of adoration and joy on the little, capped dudes face is priceless. No doubt Bill has just won the feature event. Simply amazing shot below of Bill’s T37A passing a Chrysler at speed- this photograph is the cover shot of Kent Patrick’s biography on the great man, a work I must acquire. 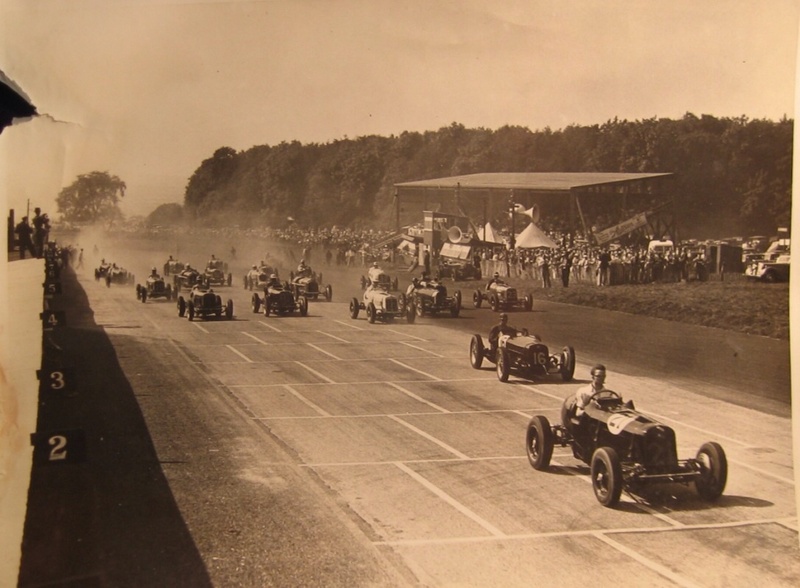 The impressive line up of cars before the Fifty Mile Handicap race includes, from the left, the Percy Hunter driven JAS Jones owned Alfa 6C1750 Zagato, the obscured Bill Thomson Bugatti T37A and two Chrysler 4 litre machines of E Patterson and #72/14 Herb Beith. 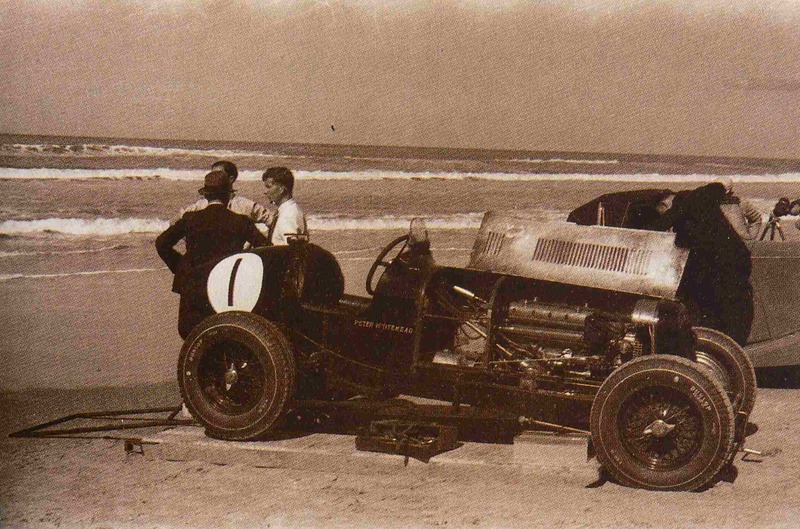 Any idea what the car below is folks, I thought for a bit it might have been Charlie East’s Bugatti T37 ‘37104’ in the paddock, or more specifically, on the beach- but it isn’t! Any clues? You can see from the gaggle of cars below going around one of the markers which defines one of the extremities of the ‘track’ that the tide is rapidly marching in. No idea of the cars, assistance invited. The masked avenger below appears to be another lady racer but I’ve no idea as to name or mount. 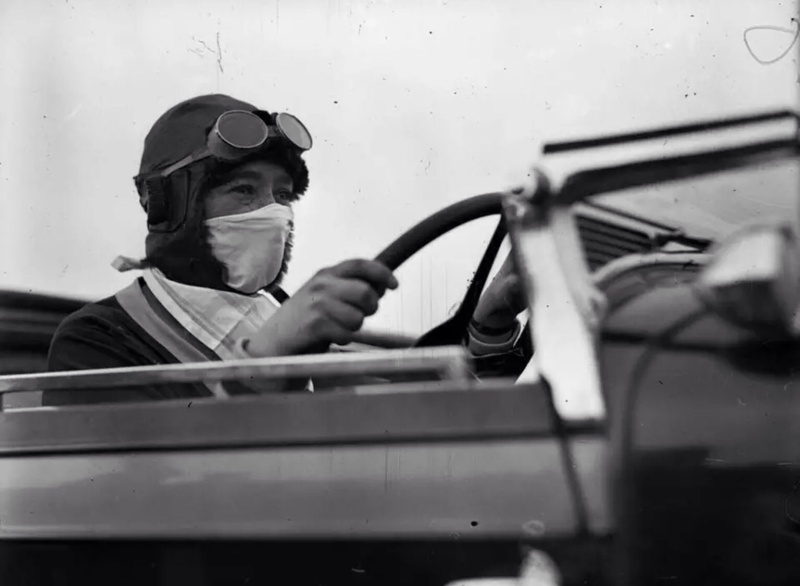 Evocative shot, the mask is protection from the sea gales and sand but reminds me of the first use of Nomex masks circa 1967. And I thought wet Winton in May can be a pain in the arse! Definitely time for a few bevvies by this stage of the day. Car make and model? 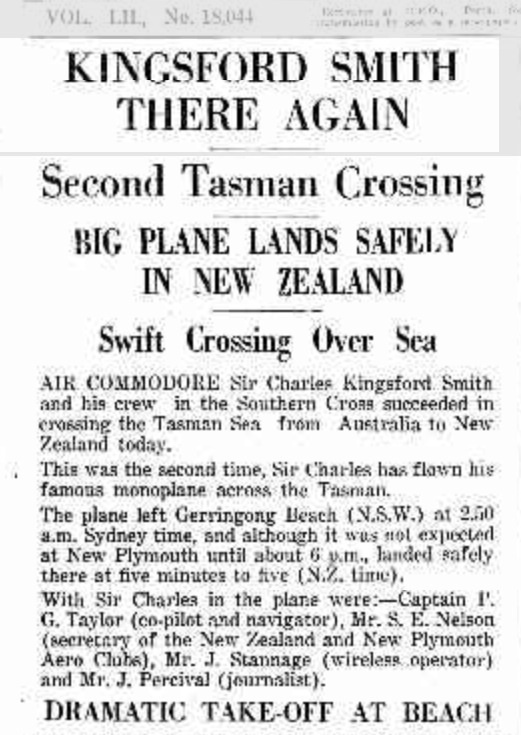 Charles Kingsford-Smith used the beach at Gerringong to fly to New Zealand, above the ‘Southern Cross’ has just landed. Seven Mile Beach was used as the runway for the first commercial flight between Australia and New Zealand. 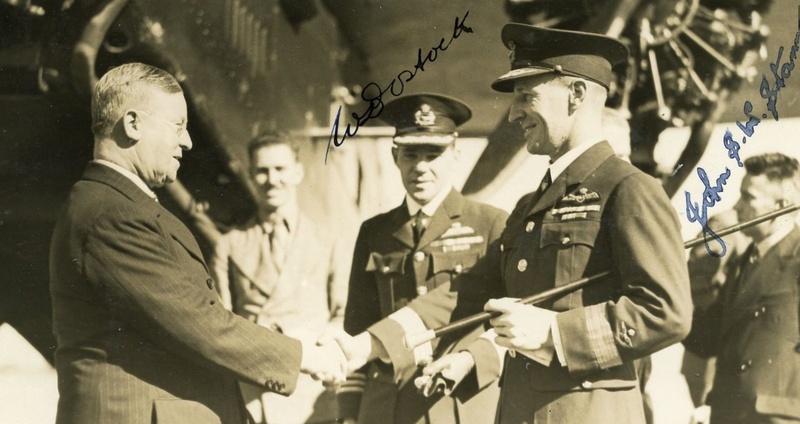 The historic journey by legendary pilot Air Commodore (and later) Sir Charles Kingsford Smith took place in the early hours of January 11 1933, he landed more than fourteen hours later at New Plymouth on New Zealand’s North Island. 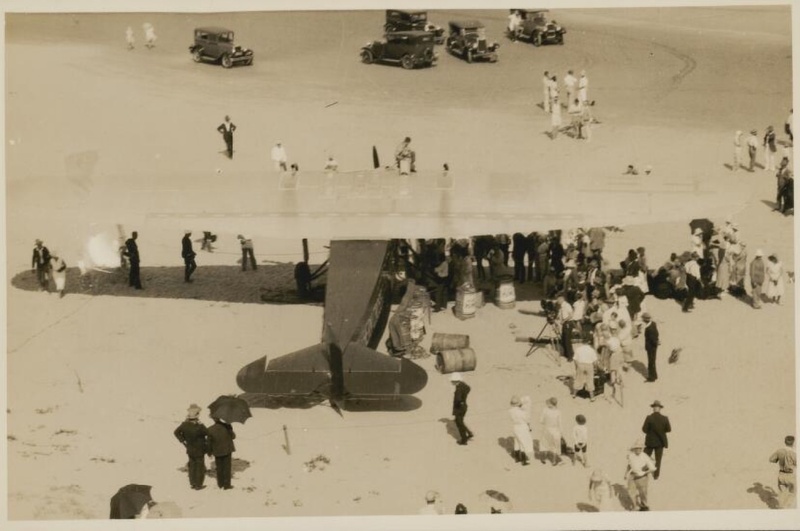 Gerringong Beach was chosen, for this, his second flight across the Tasman, because of its length which allowed plenty of distance to get the heavily laden plane off the deck- on board was 660 gallons of fuel and 30 gallons of oil as well as a crew of four. 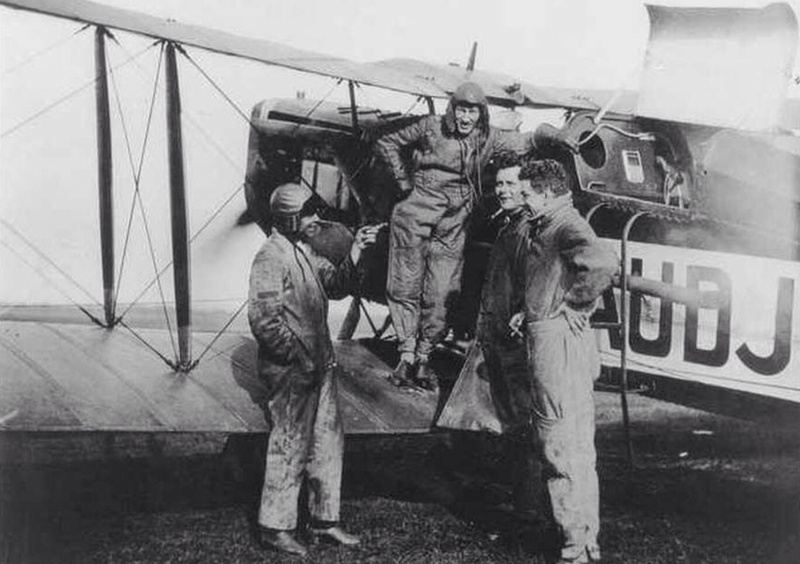 The famous aviators flight log describes the trip as a joyriding tour, his crew comprised co-piot and navigator PG ‘Bill’ Taylor, wireless operator John Stannery and SE Nelson, secretary of the New Zealand and New Plymouth Aero Clubs. The aircraft was flown down from Mascot Airfield, Sydney on January 10 averaging 115 mph for the trip. 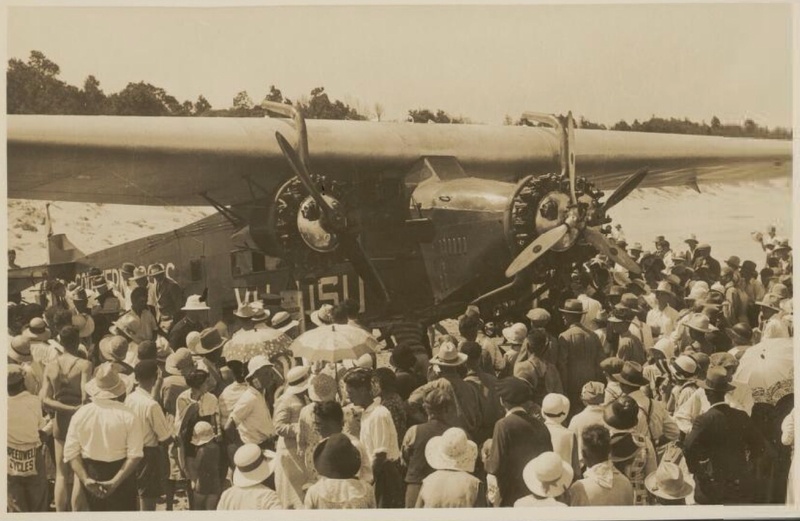 Once on the ground the plane was pronounced fit and the engines were covered to prevent ingestion of air blown sand, it was refuelled with chamois leather providing the filter! Flares were lit early on the beach to mark a runway with several thousand people making the trip from Sydney to witness the historic 2.50 am takeoff- turning on their headlights to provide the aviators with extra illumination. 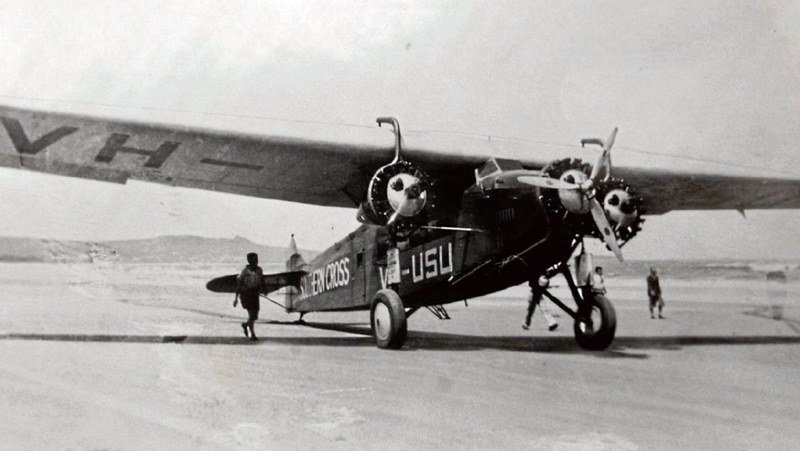 The motorists were requested to keep their headlights on for 15 minutes after departure with Smith firing some rockets or flares to signal all was well once the ‘Old Bus’- the Fokker Trimotor VH-USU ‘Southern Cross’ was aloft. ‘Smithy’s last flight was aboard a Lockheed Altair which disappeared in the dark, tropical heat off Burma in November 1935. 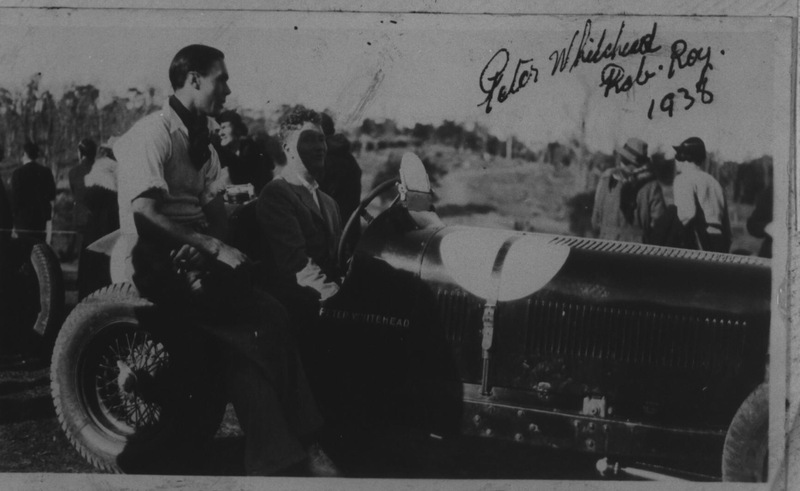 Peter Whitehead raced his ERA R10B extensively around Australia in 1938 most notably winning the Australian Grand Prix at Bathurst over the Easter long weekend and the Australian Hillclimb Championship at Rob Roy in outer Melbourne’s Christmas Hills later in the year. 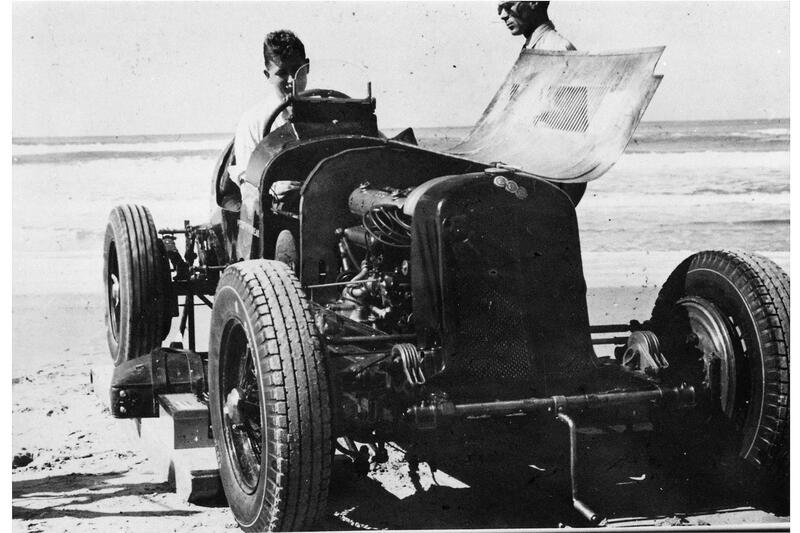 Here ‘the boys’ are hauling the car off the beach through thick sand. These dudes have well and truly lost the battle with the Pacific Ocean tide! It is a competitors car too, #18 in an earlier shot. Posted: April 16, 2015 in Obscurities, Who,What,Where & When...? It was said in those far away pre-synthetic fabric days that Australia ‘rode on the sheeps back’, 120 million of the critters roamed Australia in 1938, we clothed the world, with 50% of the wool clip sold to the United Kingdom. Peter Whitehead was a member of a wealthy Bradford family with extensive interests in the textile industry including Australia. The family company, ‘W & J Whitehead’ were worsted wool spinners making yarn for products ranging from clothing to furniture. 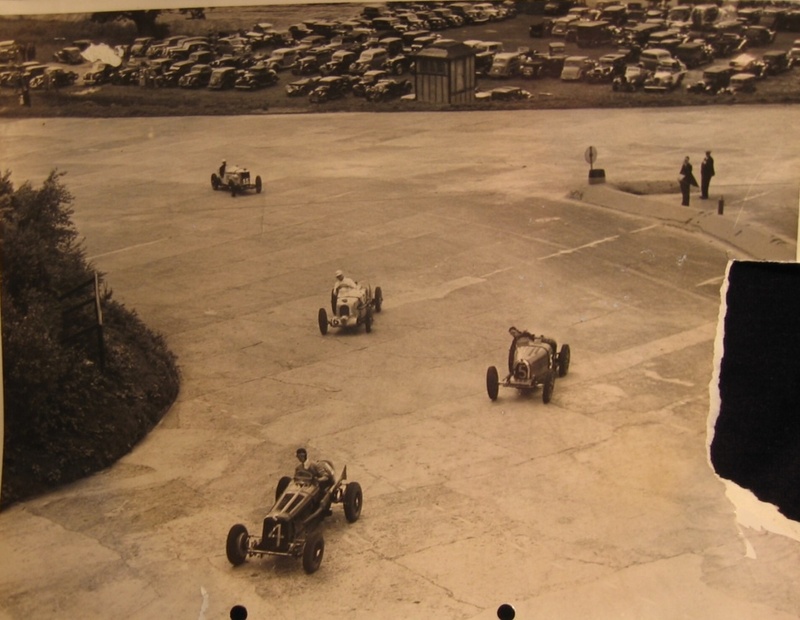 Whitehead lived on a farm near Reading, ‘Motorwork’ of Chalfront St Peter was the base for his racing activities. 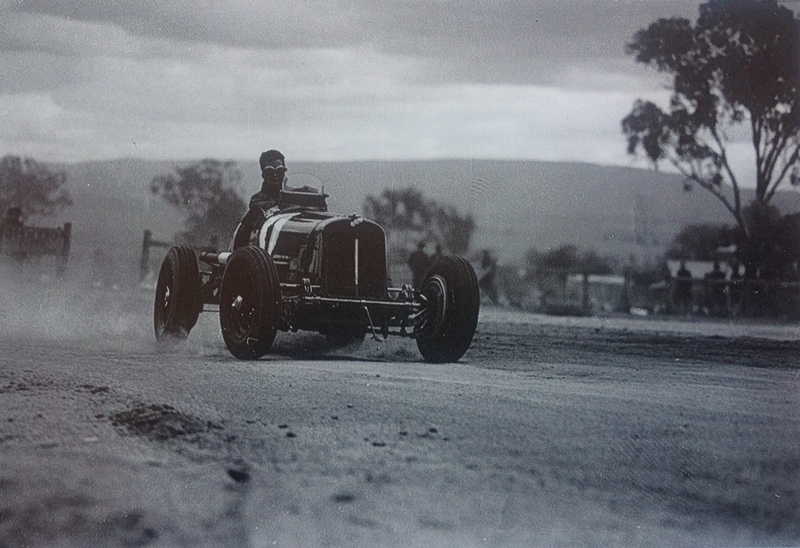 He was despatched to the Colonies in 1938 to help expand the family empire, his ‘tour’ creating enormous press and public interest as, in addition to his ‘sheep shears’ he brought with him ERA R10B the ‘fastest car in Australia’. 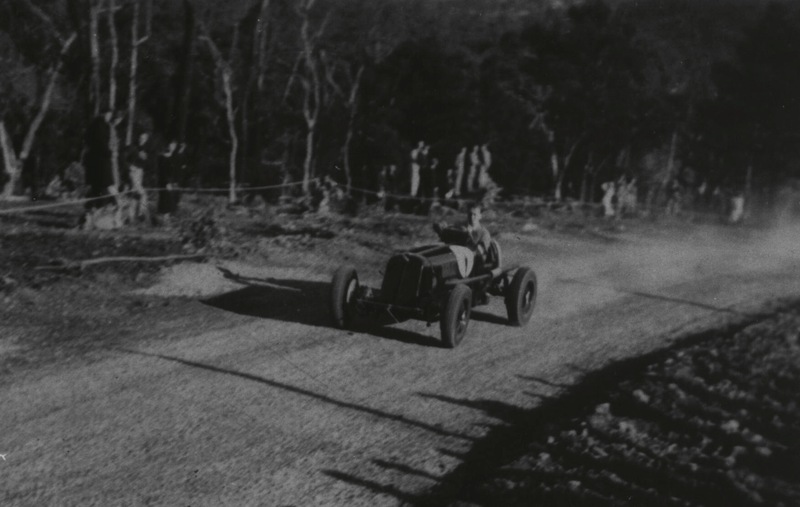 During his visit he ran the car at every opportunity in addition to his well known victory in the 1938 Australian Grand Prix at Bathurst including several attempts on the Australian Land Speed Record. 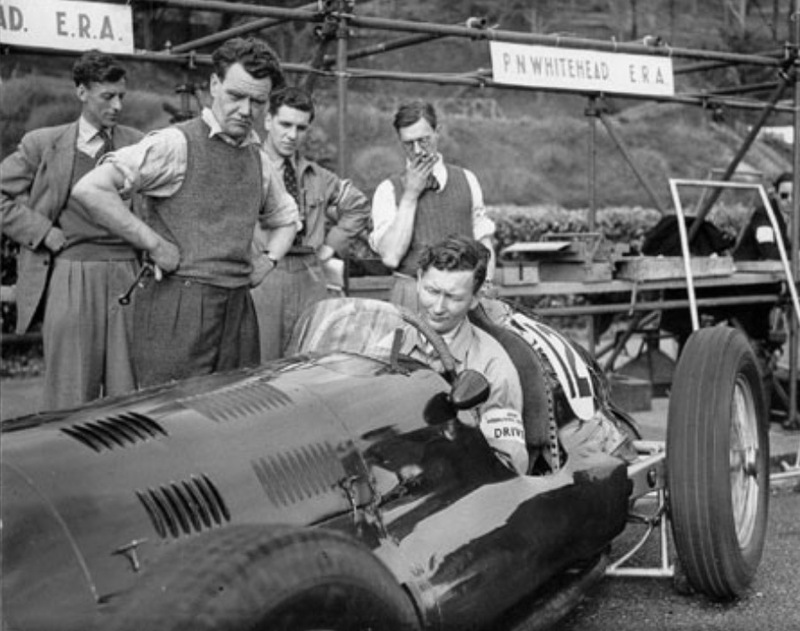 Whitehead, born in Yorkshire on 12 November 1914, started racing in a Riley progressing to an Alta and soon the ERA, acquired new from Raymond Mays and Humphrey Cooks’ concern in 1936. 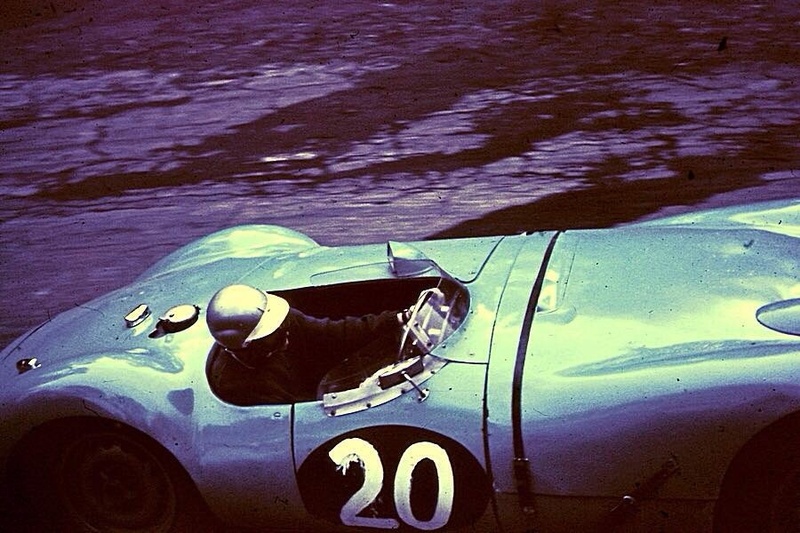 Peter was a ‘wealthy amateur’ but also a fast world class driver, a lifelong enthusiast who won Le Mans in a ‘C Type’ Jaguar in 1951 in a long, varied career in sports cars and single seaters. His life was cut short by a 1958 Tour de France crash, he was a passenger in a Jaguar Mk1 driven by his half-brother Graham. 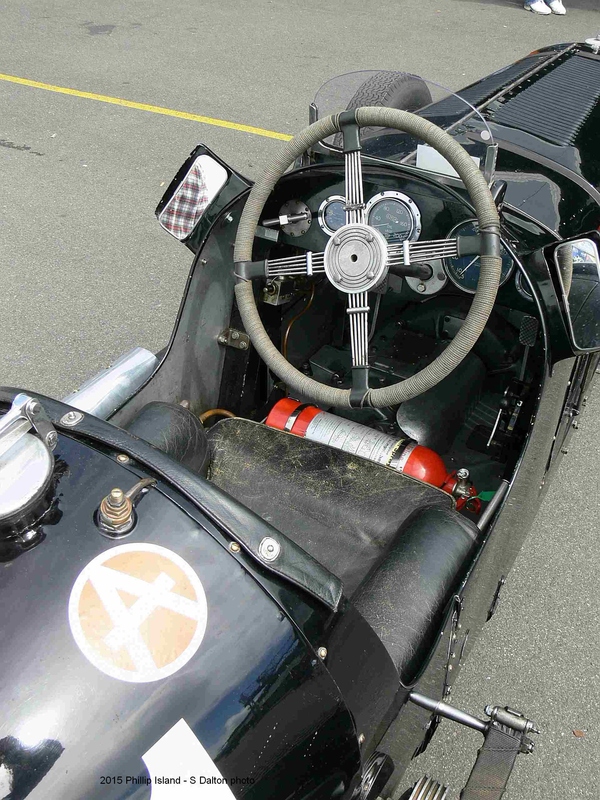 But back to the start…he commenced racing a Riley, quickly progressing he finished third in the Limerick GP, a Formula Libre race, which was the first major result for Geoffrey Taylor’s Alta firm. 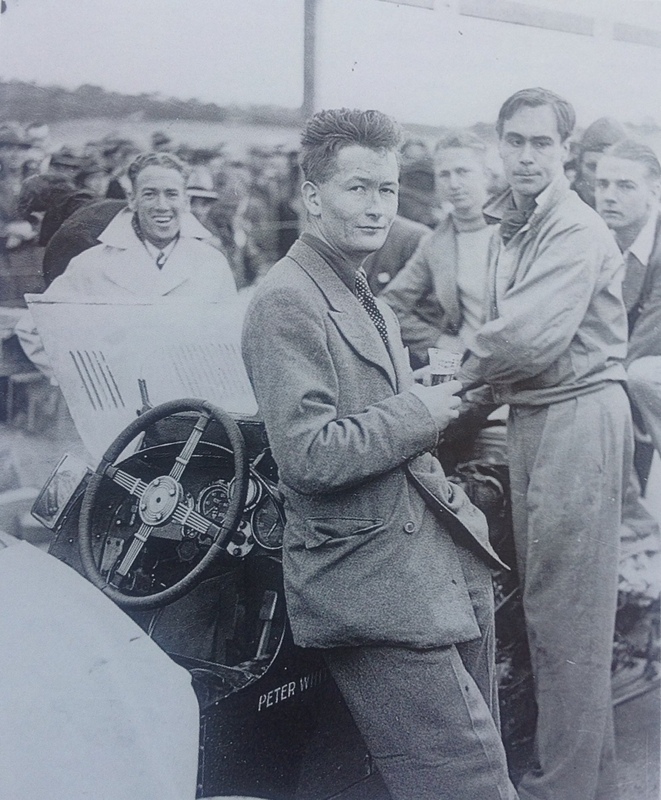 In 1936 he finished third in the Donington Grand Prix, sharing his ERA, with his driving partner in the car throughout, Peter Walker. During the war he joined the RAF as a pilot. 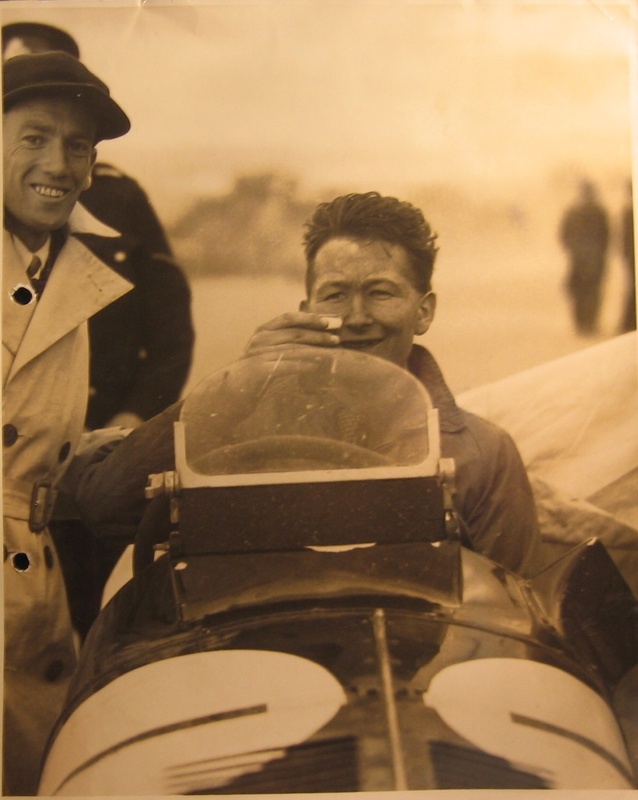 Once the war was over he was back racing, taking his ERA to second place in the British Empire Trophy on the Isle of Man in the summer of 1947. Later that year he raced at Lausanne as well. In 1948 he survived a plane crash at London’s Croydon Aerodrome being seriously injured. He had been preparing to fly to Milan to arrange the purchase of a Ferrari 125. 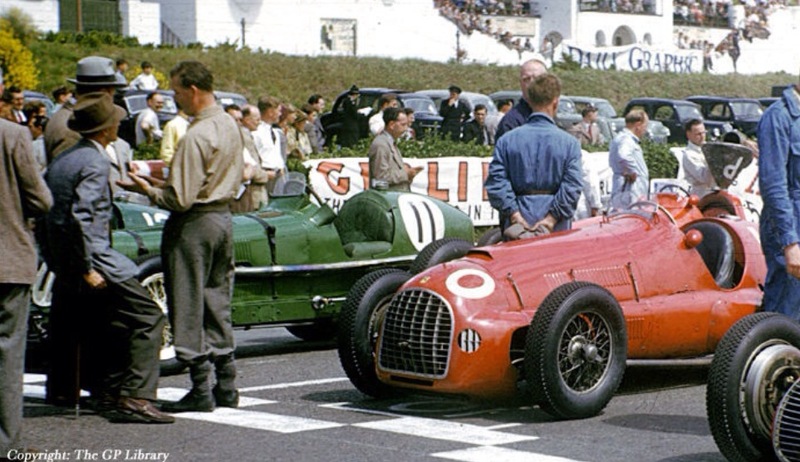 In 1949, after convincing Enzo Ferrari to sell him the car, he became the first Ferrari F1 privateer. With the green painted 125, he won the Czech GP, becoming the first Briton to win a major race abroad since Seaman. He almost won the French GP as well but gearbox problems pushed him back to third. 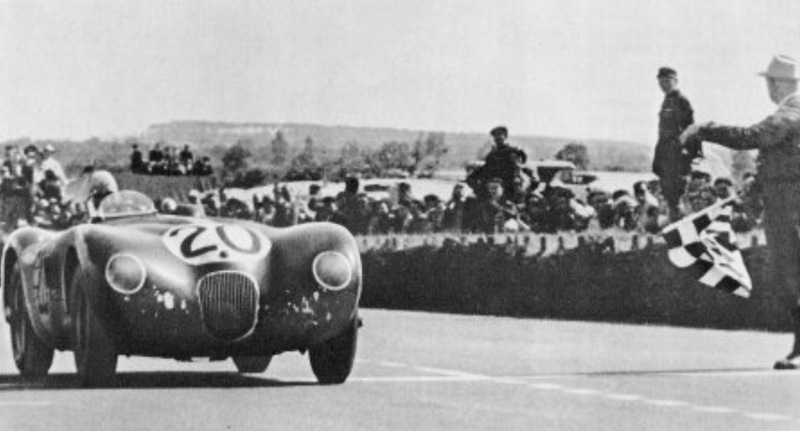 In 1950 he won the Jersey Road Race and the Ulster Trophy at Dundrod and achieved a career highlight at Le Mans in 1951 sharing the winning Jaguar ‘C Type’ with Peter Walker. He continued to race and win in Formula 2 events across Europe in 1951 and 1952 with an Alta, a Cooper-Alta and his Ferrari.In 1953 he shared victory with Stirling Moss in the Reims 12 Hour in a C-Type Jaguar winning the race again the following year in a D Type, sharing with Ken Wharton, the ‘D’s first win. 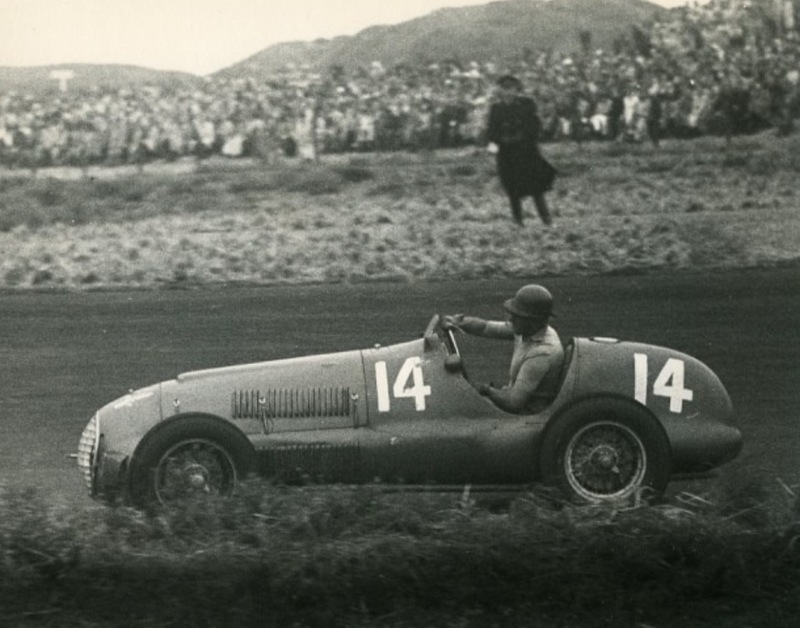 In 1953 he won the French 12 Hours of Hyeres and added Ferrari single-seater victories in the Lady Wigram Trophy in New Zealand and in the Rand GP in South Africa. 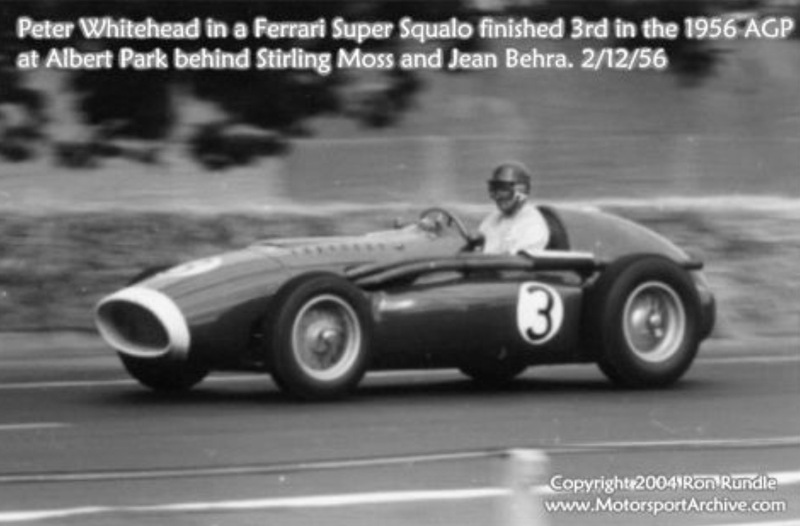 He returned to Australia in 1956 contesting the ‘Olympic Grand Prix’ at Albert Park finishing 3rd in his Ferrari Super Squalo in the race won by Stirling Moss’ works Maserati 250F. 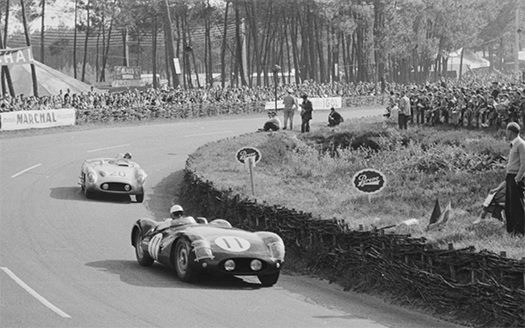 At Le Mans in 1958 he shared the second-placed Aston Martin DBR1 with his half-brother Graham then, a couple of months later, Peter lost his life during the Tour de France. Their Jaguar, with Graham at the wheel, crashed over a bridge parapet into a ravine, injuring Graham and killing Peter. ERA was founded by Humphrey Cook, Raymond Mays and Peter Berthon on November 6 1933 and established in Bourne, Lincolnshire next to Eastgate House, Mays family home. 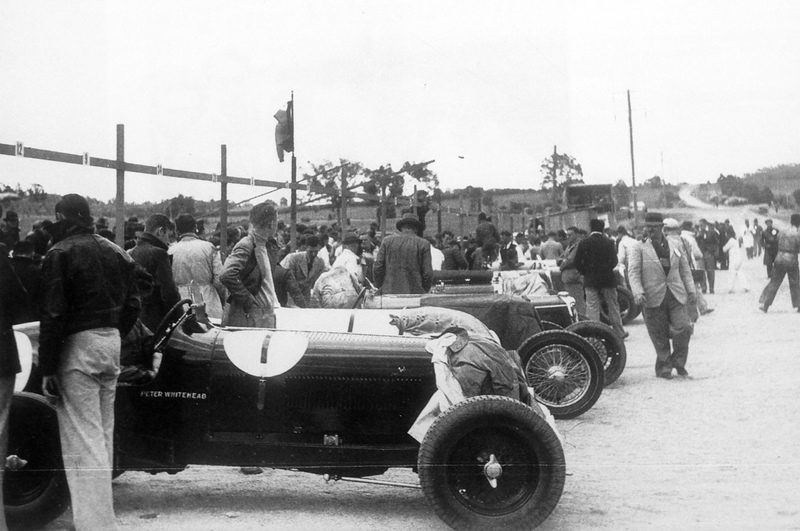 Their ambition was to build a team of single seaters capable of upholding British prestige in European racing. Given the cost of Grand Prix racing, they focussed on the smaller voiturette, 1500cc supercharged class, the Formula 2 of the day. Humphrey Cook financed the operation. 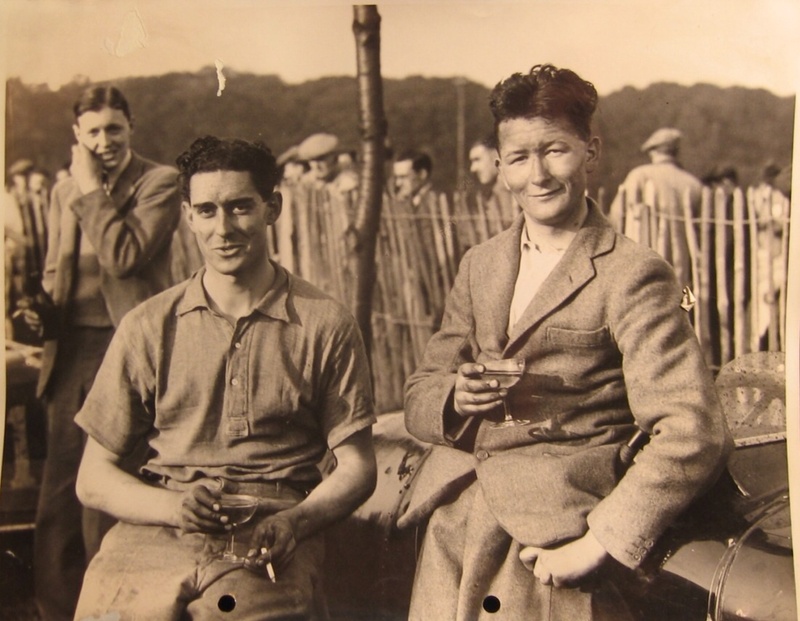 Peter Berthon was responsible for the overall design of the cars, while Raymond Mays became its principal driver, he had most recently raced the ‘White Riley’, the success of which inspired Cook to back its creators in founding ERA. It’s said the first design drawing by Reid Railtons’ assistant Ralph Beauchamp was dated 23 October, before ERA was formally incorporated. 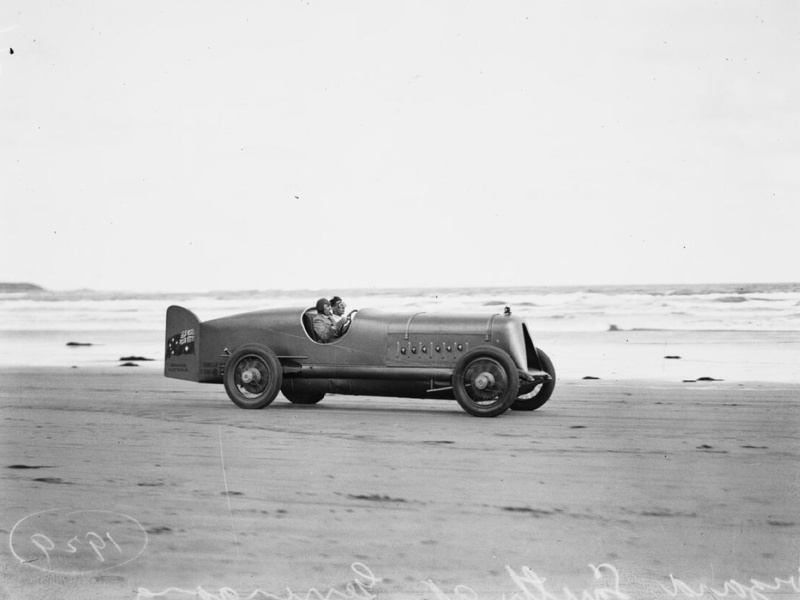 The chassis, a channel section frame, was designed by Railton who had also successfully designed the Bluebird Land Speed Record cars for Malcolm Campbell. 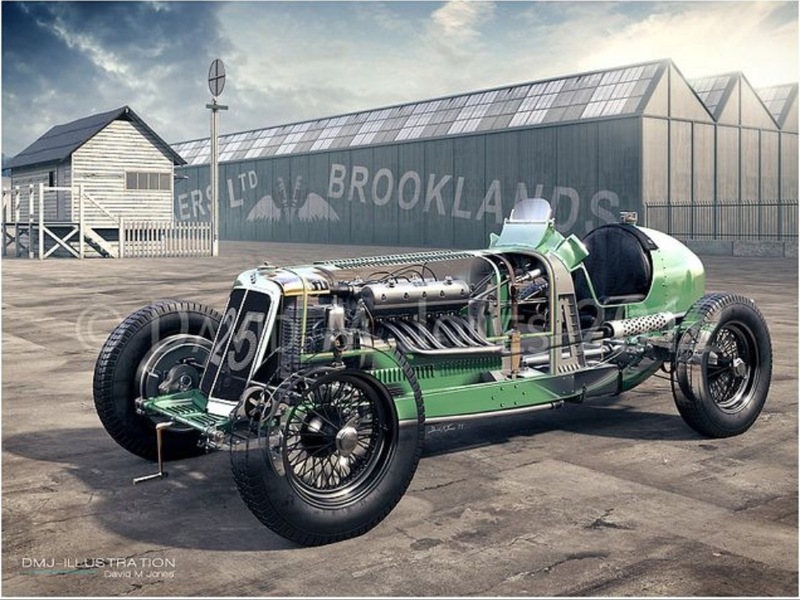 The frame was built by Thomson & Taylor at Brooklands. The wheelbase was 96 inches, the front and rear track 52.5 and 48 inches respectively. Panel-beating brothers George and Jack Gray hand crafted the bodywork, to a design credited to a Mr Piercy who had previously designed ‘Bluebird’s body. Suspension front and rear (A & B types, the works team raced the ‘A Type’ in 1934/5, the ‘B Type’ had a slightly revised chassis and more reliable engine) comprised ‘H Section’ live axles forged by Hadfields, sprung by semi-elliptic leaf springs, dampers were Hartford friction type. 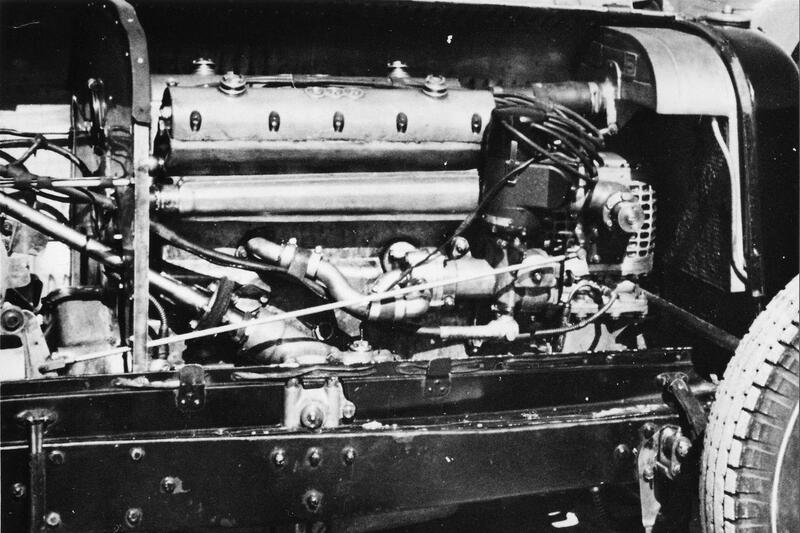 The engine was based on the well proven Riley 6-cylinder unit, modified in a number of significant ways. A stronger forged crankshaft with a large centre Hyatt roller bearing, 3 main bearings in all, was made and an entirely new aluminium cylinder head designed. The engine used a bespoke supercharger designed by Murray Jamieson which was fed by a single SU carburettor. One plug per cylinder was ‘sparked’ by a Lucas magneto. The ERA engine was designed in three capacities; a base 1488cc, 1088cc and 1980cc. It ran on methanol, in its 1500cc form it produced circa 220-240 bhp with in excess of 275 bhp in 2000cc form. The cars were fitted with Wilson four-speed pre-selector gearboxes, Girling mechanical brakes and 16X5.25 inch tyres, total dry weight was 2016 pounds. The unveiling of ERA, ‘R1A’ took place at Brooklands on 22 May 1934. 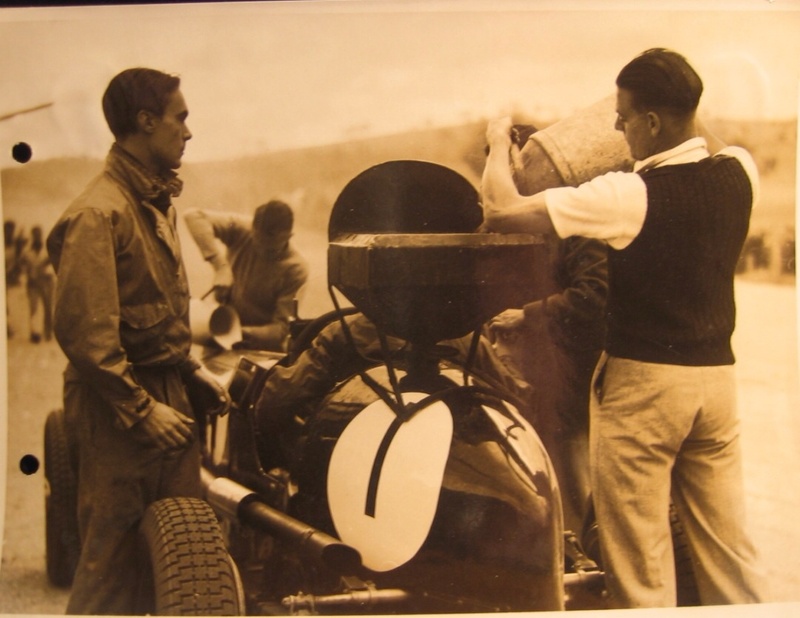 After initial handling problems, which required a number of modifications, ERA had a winning formula. By the end of the year ERAs had scored notable victories against many more established marques. R10B was built to Peters’ order in 1936 with a capacity of 1.5 litres. The price quoted was 1500 pounds. R10B remained 1.5 litres in capacity until Whitehead fitted a 2 litre engine and two-stage blower in 1949, but for the period we are covering was a ‘standard’ spec 1.5 litre ‘B Type’ ERA. 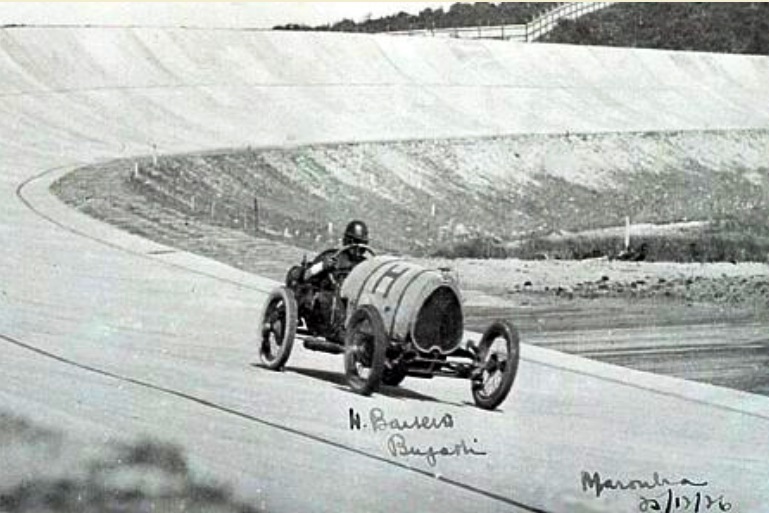 That Whitehead tested his ERA or ‘ran in his engine’ on what remained of the Maroubra Speedways’ concrete bowl whilst in Australia does not seem to be in doubt. 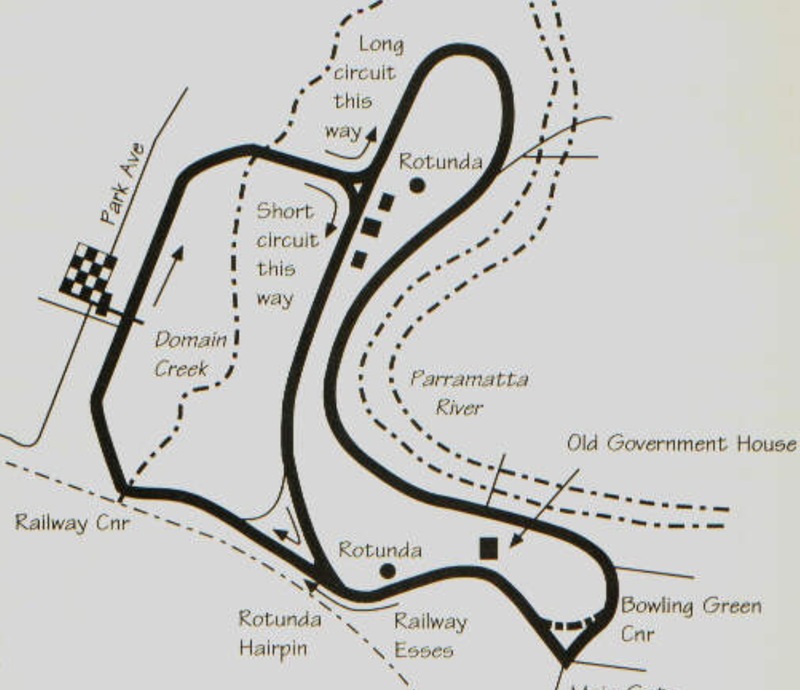 Perhaps it was prior to travelling to Mount Panorama. This is plausible if the car was shipped from the UK to Sydney, docking at King Streets ‘Hungry Mile’, infamous as the place where thousands of unemployed labourers sought a days work in the long years of the depression or Jones Bay Wharf in Pyrmont. 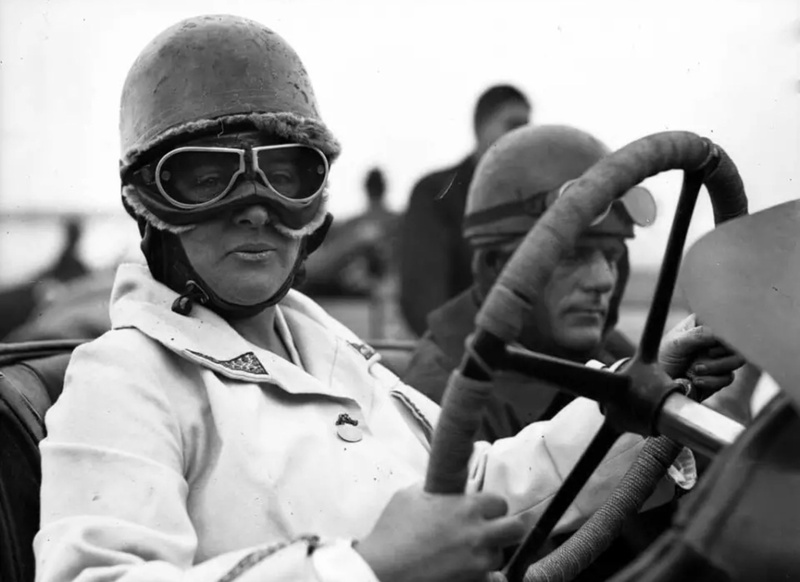 To test the car with the resources of the Sydney ‘fettlers’ closeby makes ‘racers sense’ after the ERA’s long voyage. 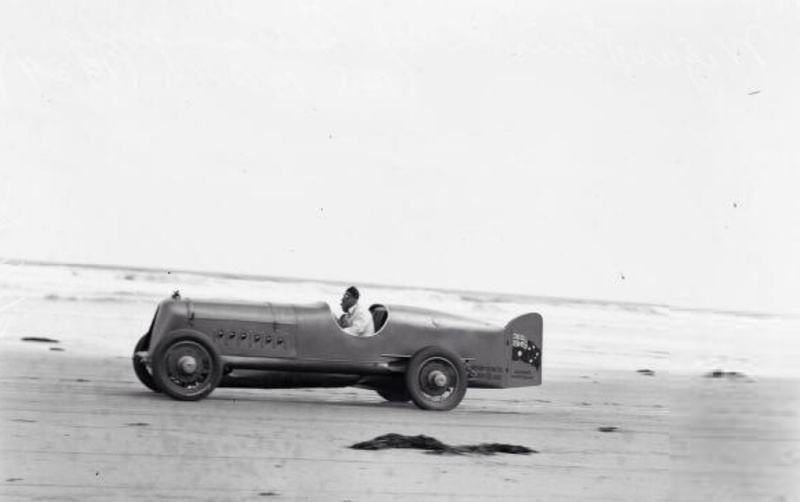 The other possible time of the Maroubra test was perhaps after the failure of a piston and the engines rebuild or replacement after the cars failed Australian Land Speed attempt at Gerringong Beach, NSW on November 10. 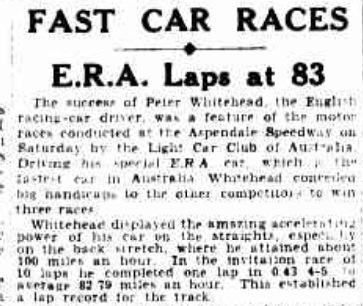 That seems to have been the cars last event in Australia, R10B needed to be race ready for the 2 events in South Africa Whitehead contested in January 1939 on the way back to the UK. Maroubra is a Sydney Southern Beaches suburb adjoining internationally known Bondi. ‘Snakes were a major problem as they would come out during the heat of the day to soak up the suns rays on the race track, a bit of a worry with no protection from another cars wheels flicking up a Dugite snake into the open cockpit’. Hmm, yep! Plagued with problems the short 5/6th of a mile venue closed in 1927, long gone were those two years of large crowds looking on in amazement at the motorcycle racers reaching speeds of up to 100mph side by side on the big banked oval. 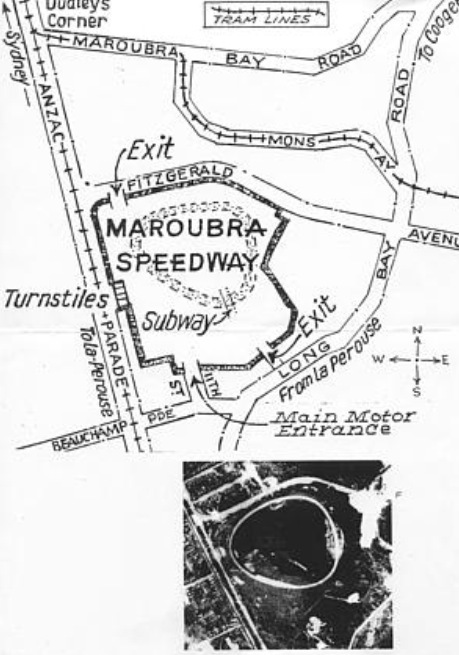 Less sensationally, Graham Howard in an article for ‘Motor Racing Australia’ remarked on the bravery of the promoters in building a facility unlike any in Australia before, the short concrete track having curves of 16 degrees and dizzying 48 degrees elevation built by contractors with no expereince in anything like it. 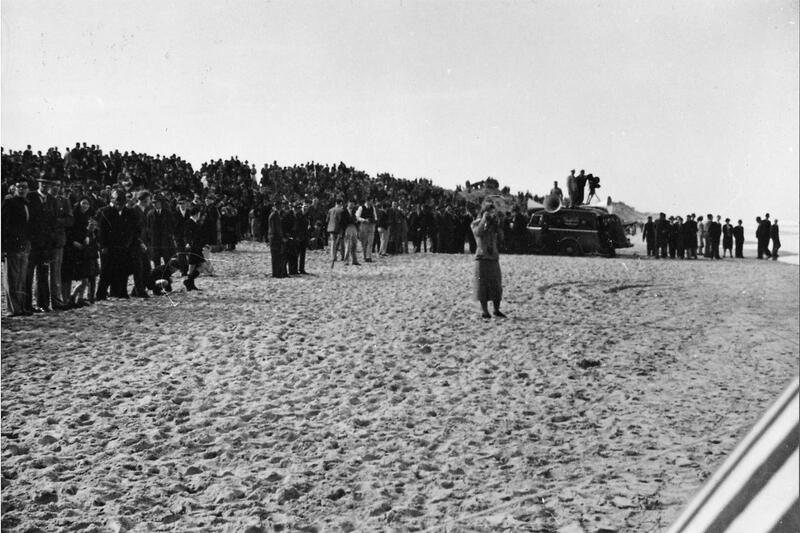 Crowds never matched any more than one third of the 60000-90000 estimated on the opening day, many spectators avoided paying for the entertainment on offer by making use of the local surrounding sandhills which attracted the investors in the first place. 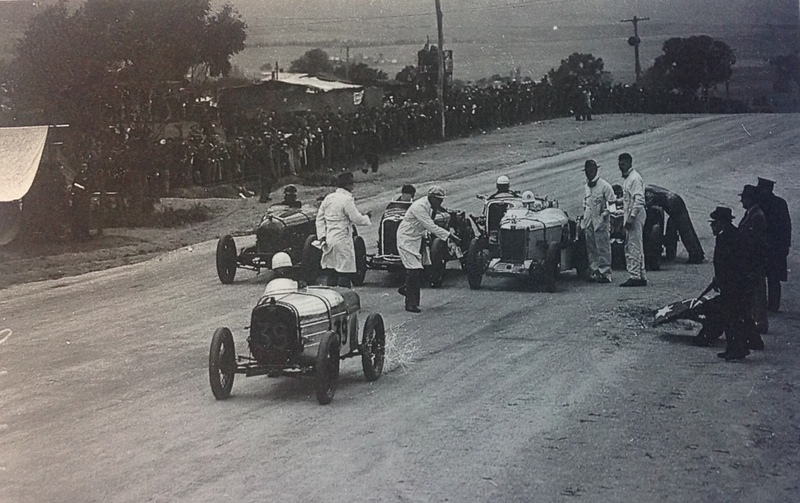 The original entrepreneurs went bust in 1926, subsequent management tried night racing for both cars and ‘bikes. The danger of the place caused competitor entries to decline, all the racer fatalities occurred on the same section of track after the north-east curve. I’ve not uncovered any photographs of Whitehead at Maroubra but have chosen a couple of period photos’ to provide the flavour of the place. The daunting circuit was newly built and had a gravel surface. 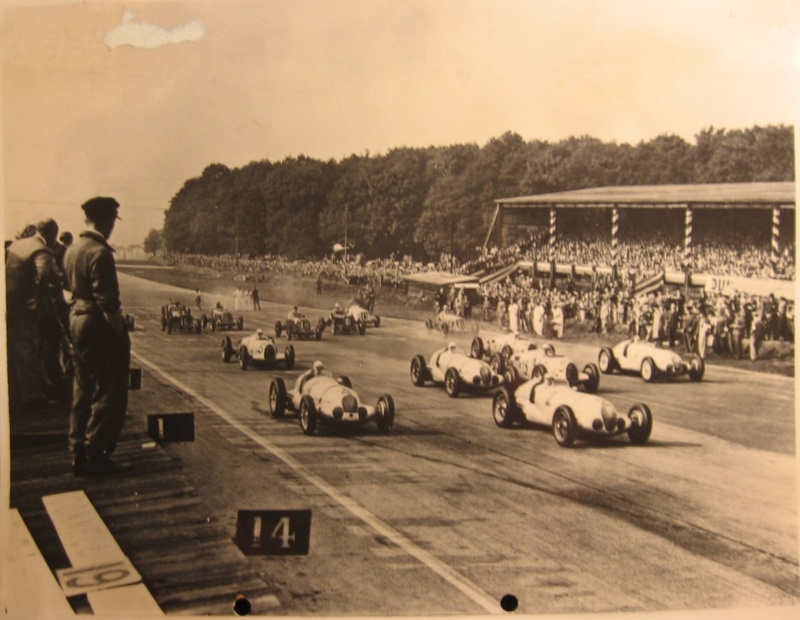 Whilst Whiteheads’ ERA was the most advanced, new car in the race, the AGP was held to Formula Libre and handicapped until 1953 due to the paucity of equivalently competitive cars, the sport very much an amateur activity at the time. 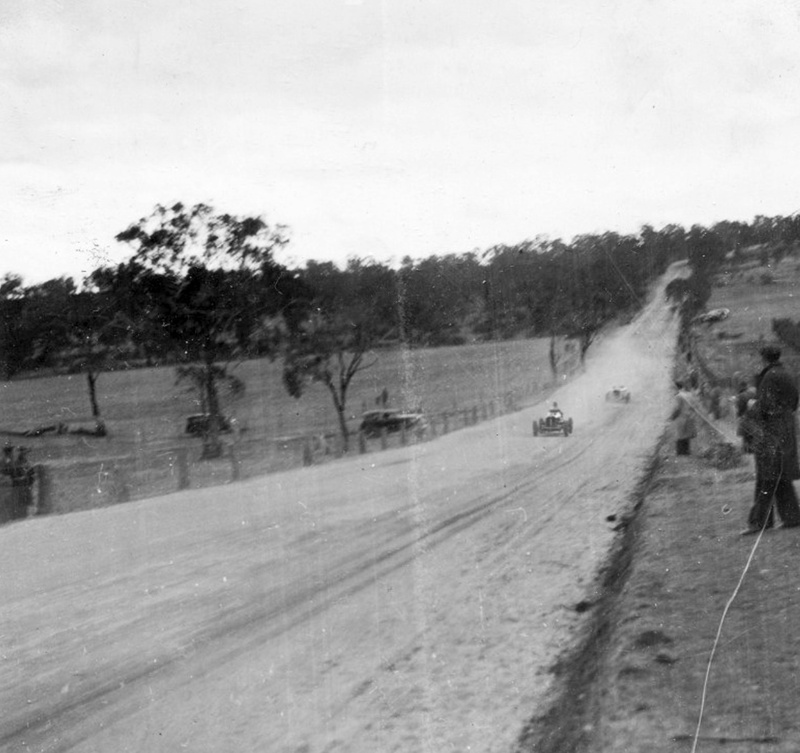 John Medley wrote the 1938 Chapter of Graham Howard’s magnificent ‘History of The Australian Grand Prix’, Medley records…’The new circuit over Bald Hills near Bathurst was the sene of the 150 Mile AGP…The first ‘real’ AGP outside Victoria, it drew the largest field so far, 39 entries, it continued the trend towards larger engines, it had a multi-state entry (and 2 from the UK), it produced the first overseas winner of an AGP, and was run on the only one of the great traditional old circuits to survive to the present day’. The ERA dominated the entry list, the car had been raced by both Whitehead and Peter Walker, having finished 3rd in the 1936 Donington GP, the 1936 Nuffield Trophy, the 1937 Junior Car Club 200 Mile event at Donington and the 1937 Empire Trophy also at the Leicestershire circuit. 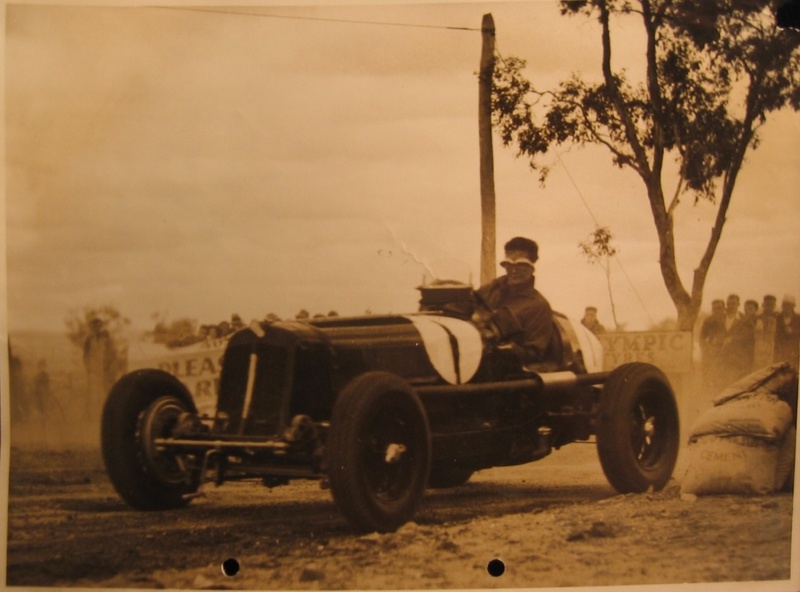 Medley reports the quickest Australian cars entered were the McIntyre owned, Frank Kleinig driven ‘Kleinig Special’ an 8 cylinder Terraplane powered car based on an MG ‘L Type’ Magna chassis (the development of this amazing car over 15 years is a story in itself). 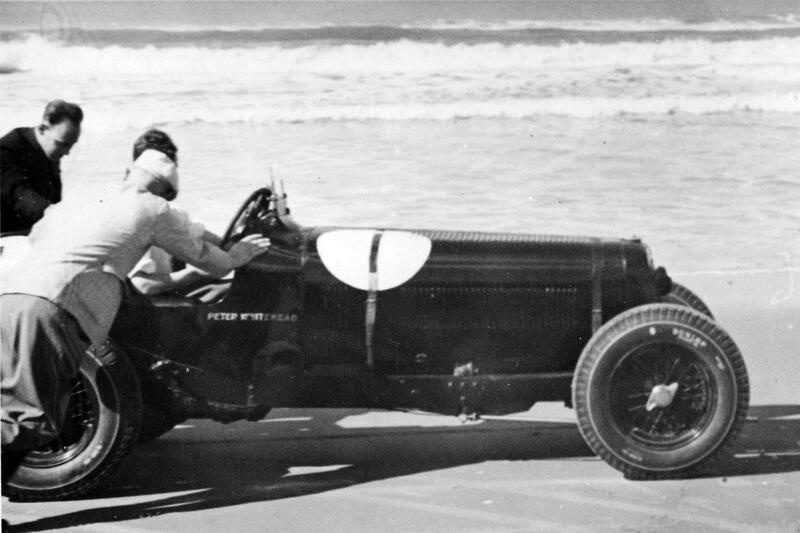 Tom Peters was entered in the Ford V8 powered Bugatti T37A which won both the 1930 and 1932 AGP’s at Phillip Island in Bill Thompsons’ hands. Colin Dunne entered an ex-Bira MG K3, Jim Fagan another K3, ex-Birkin/Don/Hall, and Lyster Jackson the final K3 ex-Hall. Fellow Englishman Alan Sinclair joined Whitehead racing an ex-Winterbottom Alta 1100…’The Alta an infrequent starter in Australia, being a temperamental beast-apparently like its owner who had a lively time whilst in Australia. The Alta non-started at Bathurst too, but that may have had something to do with Sinclair spending the previous Friday night in the cells on sundry drunk and disorderly charges’ Howard reports. 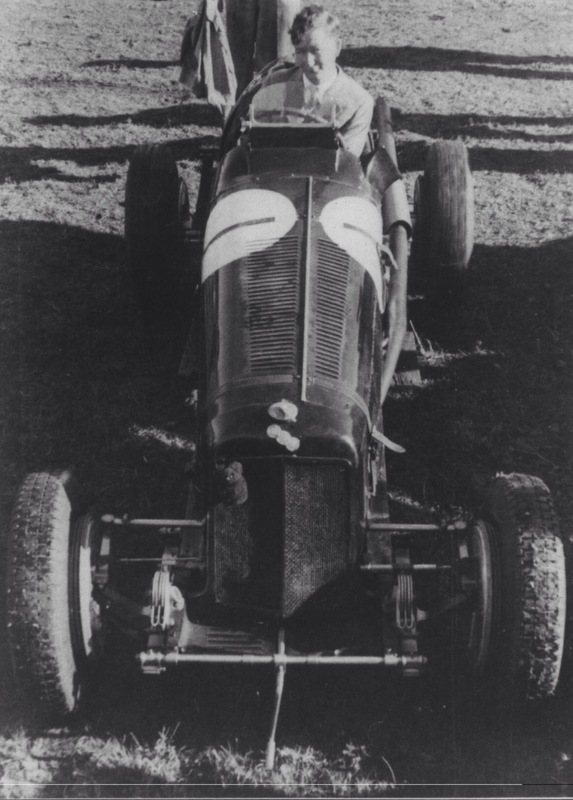 Other entries included Tim Joshuas’ Meadows engined Frazer Nash, the ‘Mrs Jones owned’ Alfa Romeo 1750SS to be driven by future AGP winner John Barraclough, George Martins’ BMW 328,(this 328 won the 1948 AGP in Frank Pratts’ hands) Barney Dentry in the Riley which won the 1932 Brooklands 500 Mile Race, Dentry having competed in all but one AGP. 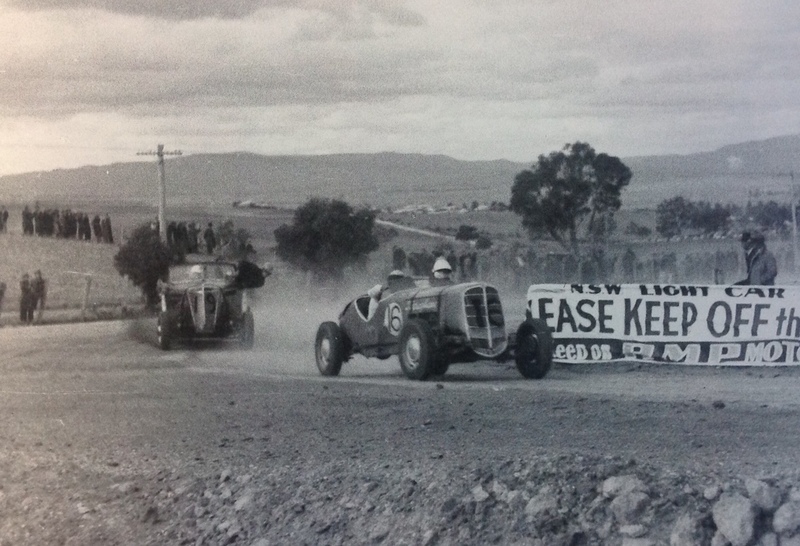 The importance of Australian Specials at the time is highlighted by the entry of George Bonsers and Harry Beiths’ Terraplane Spl’s. Wangarattas’ Jack Phillips’ entered his Ford V8 Spl, so too were Queenslander Charlie Whatmore and Arncliffe, Sydney garage proprietor Fred Foss similarly mounted. Shanghai born Bob Lea Wright was remakable chracter, a WW1 fighter pilot, national swimming champion and a good boxer who rose to the rank of Major during WW2 in the Service Corps. 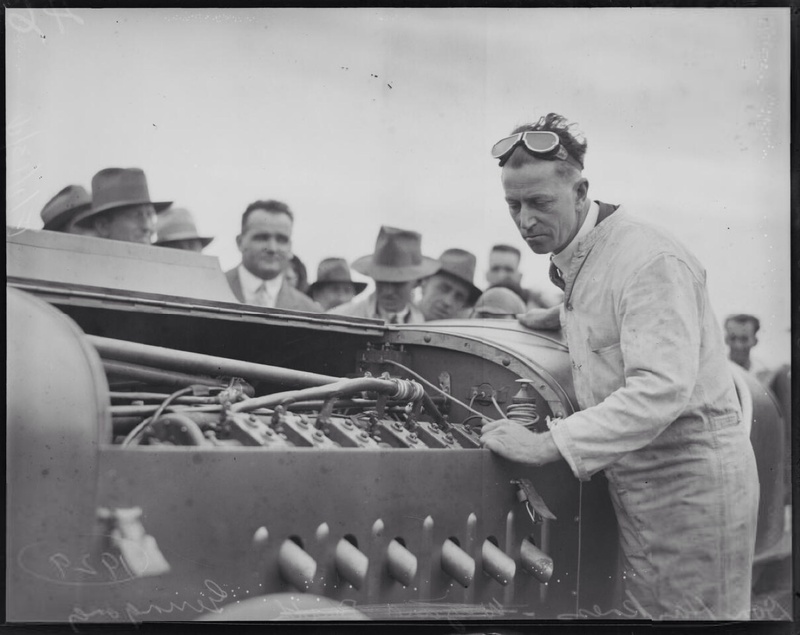 He too was in a Terraplane Spl as was Bowral, NSW, Hudson/Terraplane Dealer Les Burrows. 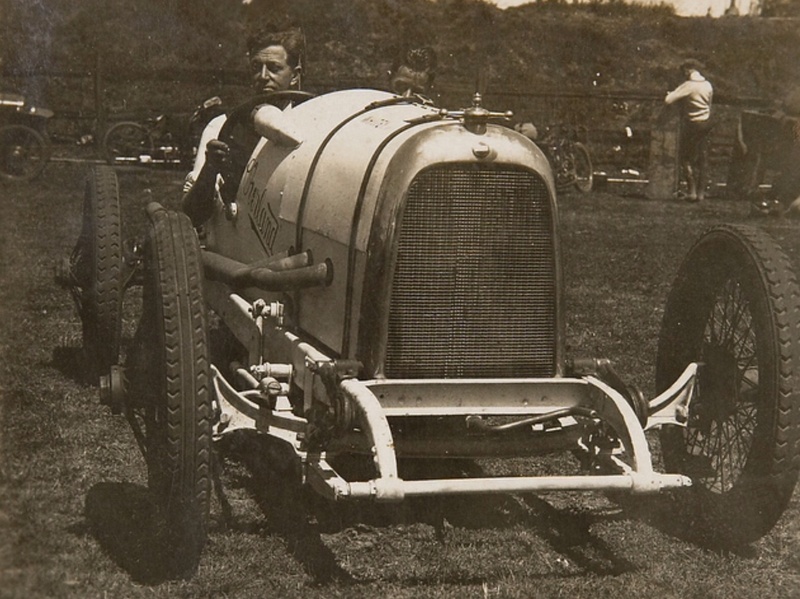 Alf Barrett, about whom i wrote not so long ago entered his Morris Bullnose Spl for Colin Anderson and the ex-Jack Day 1927 supercharged Lombard AL3 for himself. New MG ‘T’s were entered for John Crouch, Alan Crago and R Kerr stripped of ‘guards and lights as was the 1934 Riley Imp of George Thame. On the face of it the ERA was easily the fastest car in the race but the AGP was a handicap, anything can and did happen over the years the event was held to the F Libre/Handical format. 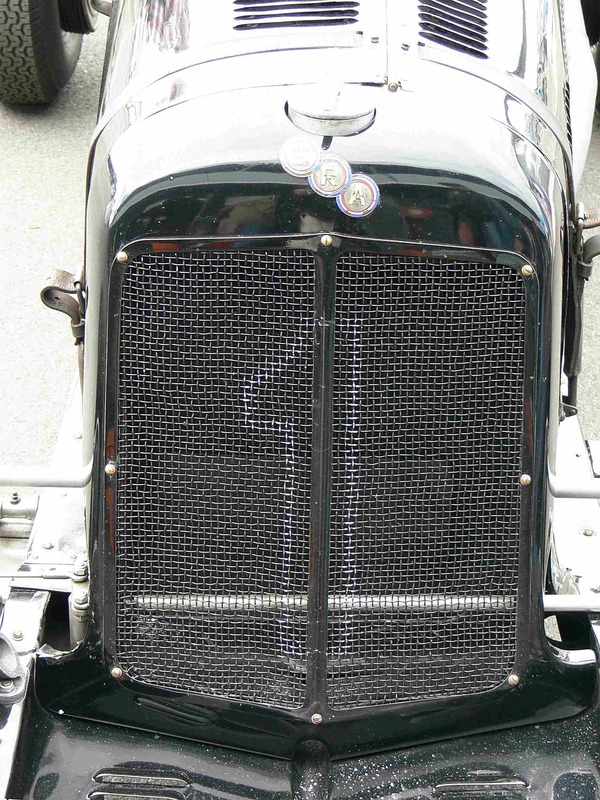 John Medley reported that ‘ Despite the bitterly cold morning over 30000 spectators thronged all parts of the circuit…After a grand parade, the limit marker, Ron Uffindells’ Austin 7 was away on its long journey. Over the next half hour the rest of the field left the line, scratch marker Whitehead leaving a blanket over the ERA radiator until the last moment’. ‘Already by the time of Whiteheads’ raucous departure there had been pitstops and retirements’; Thames Riley Imp broke its crank, Barretts Lombard was out with either magneto trouble or run bearings but Alf was impressed by the ERA, the purchase of an Alfa Monza via Thomson and Taylor shortly thereafter the result of a desire to get a competitive, reliable car. Les Murphy lost time with a long stop and Frank Kleinig retired after throwing a fan-belt. 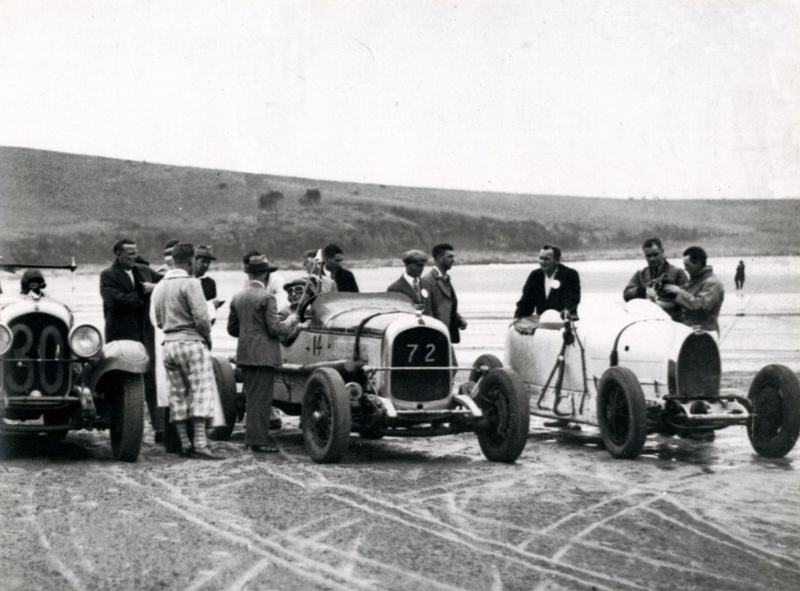 ‘So through the dust and ruts and the flying stones Uffindell lead with Anderson and Pike in pusuit…the battling MG ‘T’s were next from Crouch, Keir…further back Burrows Terraplane, the McKellar V8 but already Whitehead was looking the likely winner, lapping faster than expected’. On lap 20 Peter pitted for oil, fuel and water, by then the Norman Aubin Ford V8 Spl, Williamson Chrysler, Joshua Frazer Nash and Weir MG had retired. ‘According to the ‘Bathurst Advocate’…this intrepid Englishman apparently does not know the meaning of fear. Once or twice his car slid badly and began to waltz about on the road but he just smiled unconcernedly and set it racing on a perfect course again with the utmost simplicity’. At the 100 Mile mark the Crago MG driven now by John Sherwood lead Uffindell by a minute, Crouch and Burrows side by side across the line in third and fourth. ‘But the writing was on the wall-either Whitehead or Burrows would win’. 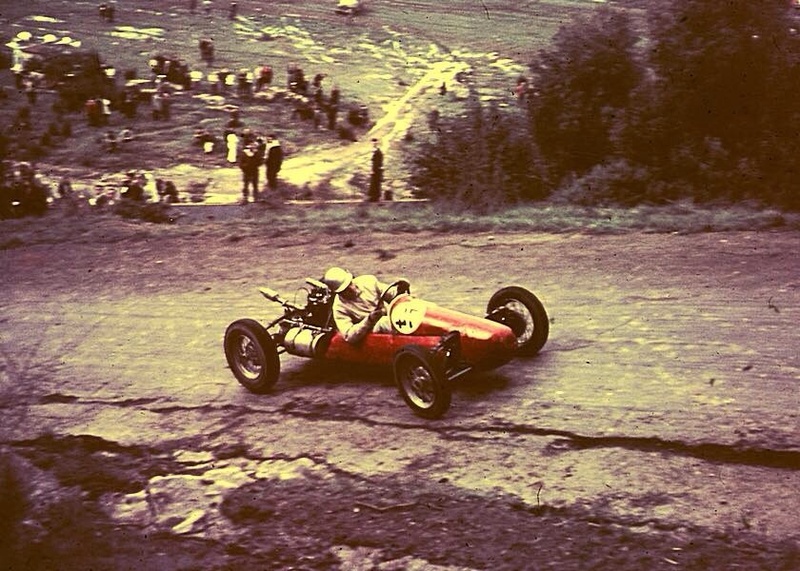 ‘The race continued with the corners badly rutted and increasingly dangerous. The Foss Ford V8 Spl, Pike and Beasley Singers and Fagans noisy megaphoned MG K3 also fell out and the Burton Alvis in a race punctured by incidents spun again at the Esses’. 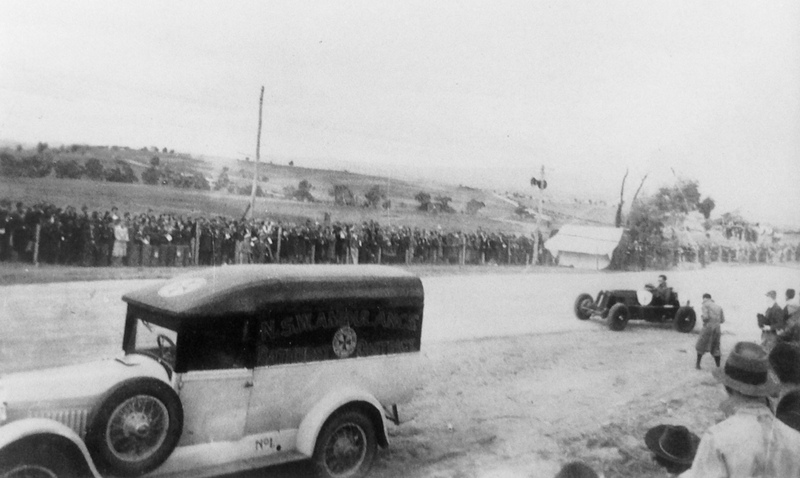 ‘On lap 30 Burrows lead by 8s from Sherwood with Whitehead in 6th place and 3m40s behind…rapid calculations suggested that Burrows might beat the black ERA home-but it was not to be; a disappointed Burrows slowed, the Terraplane sounding woolly, and Whitehead, despite a windscreen broken by a flying stone 5 laps from the end, passed him during lap 35 to forge away. Burrows maintained his distance ahead of Sherwood in the Crago MG’. Whitehead received the chequered flag from Whatmore and Sherwood. 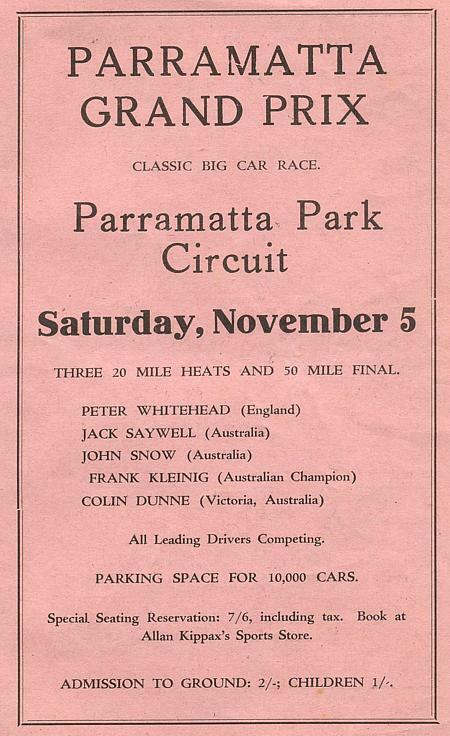 Many pitcrews disagreed with the official results, after protests the placings were; Whitehead in R10B, Les Burrows in the Terraplane Spl, Crago in MG T, T Peters in the MacKellar Spl s/c, John Crouch MG T and Jack Phillips, Ford V8 Spl. Medley…’Whitehead received a tremendous ovation at the finish and afterwards was surrounded by a huge crowd. 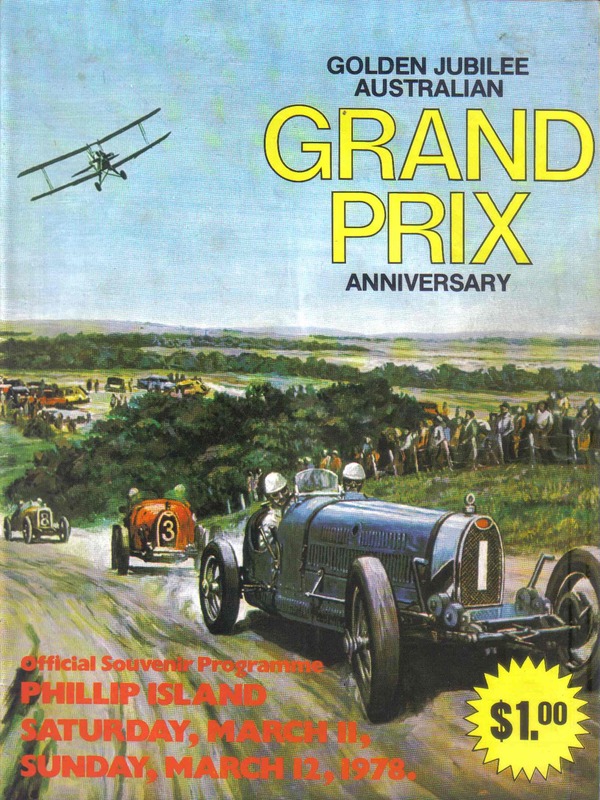 Dusty, dirty and deaf in a dark blue shirt, spotted tie and grey slacks, mug of beer in hand, he praised the circuit, fellow competitors, and the race itself: ‘I think it is a really fine track. It has the fast corners and the slow corners and a long straight that enables cars to make up lost time…when tar paving is carried out it will be hard to better it…some nasty bumps appeared down the Mount during the latter part of the race’. He said he had not been troubled by spectators walking on the track! 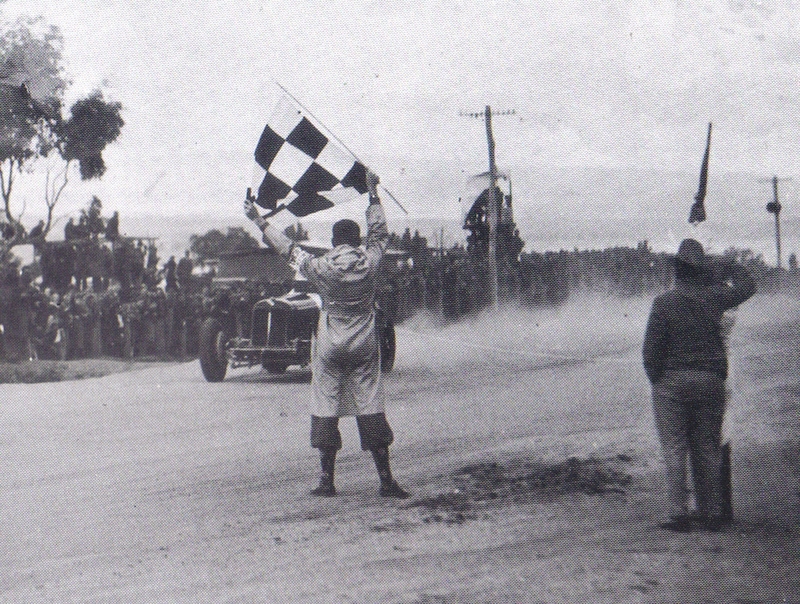 In the best traditions of motor racing Whitehead and Sinclair lead the celebrations; Jim Leech in the Light Car Club of Australia History ‘ …at the prize presentation His Worship The Mayor had just finished his address to the multitudes and was on the point of handing the winners trophy to Whitehead when he was squarely hit on the head by a large cauliflower. This being followed by a shower of similar vegetables resulting is His Worship, his 2 daughters and other Coucillors retiring in disordered haste’. 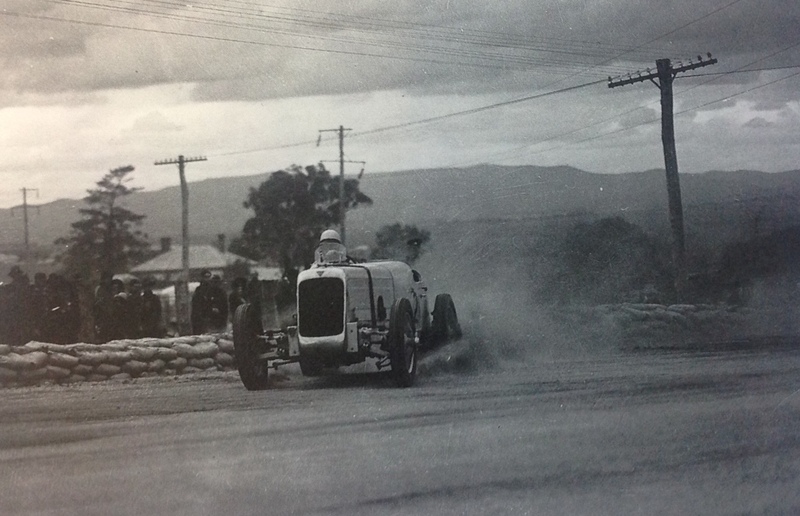 The Canberra Speed Trials were annual events conducted during the 1920’s and 1930’s featuring standing start and flying start time trials along a rural road which is now Northbourne Avenue, literally Canberras’ main street. I can find little reference to these events but the photos in Ted Hoods’ Collection in the State Library of NSW make up for the paucity of information otherwise. 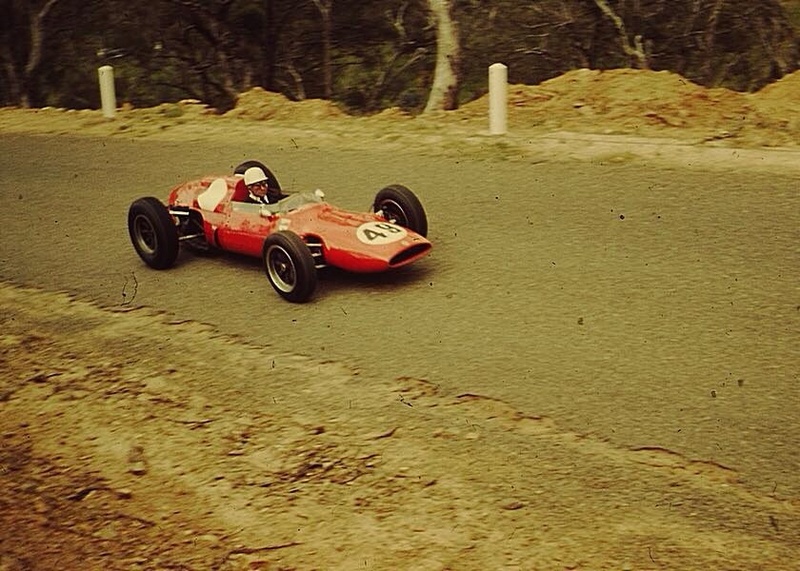 ‘Later the same year we saw the ERA at Bathurst on a circuit that was all dirt. We were at the top of Conrod looking up at The Esses and i remember the ERA coming down into Forrests Elbow in the deep wheel tracks, the fixed crank handle digging into the mound between the tyre tracks and making a noise like a machine gun’. Peter needed to run in some engine parts so did part of the journey in R10B from Canberra on the Hume Highway, the main road between Melbourne and Sydney! It’s hard to imagine Lewis Hamilton doing something similar in his ‘Benz whilst he was in Oz for the 2015 AGP. Mind you, according to one report the ERA was locked up for a bit due to this escapade. Such were those wonderful far away days. Rob Roy is still in use, it’s a short climb and was then, as so many of our venues were, unsealed until the following year. 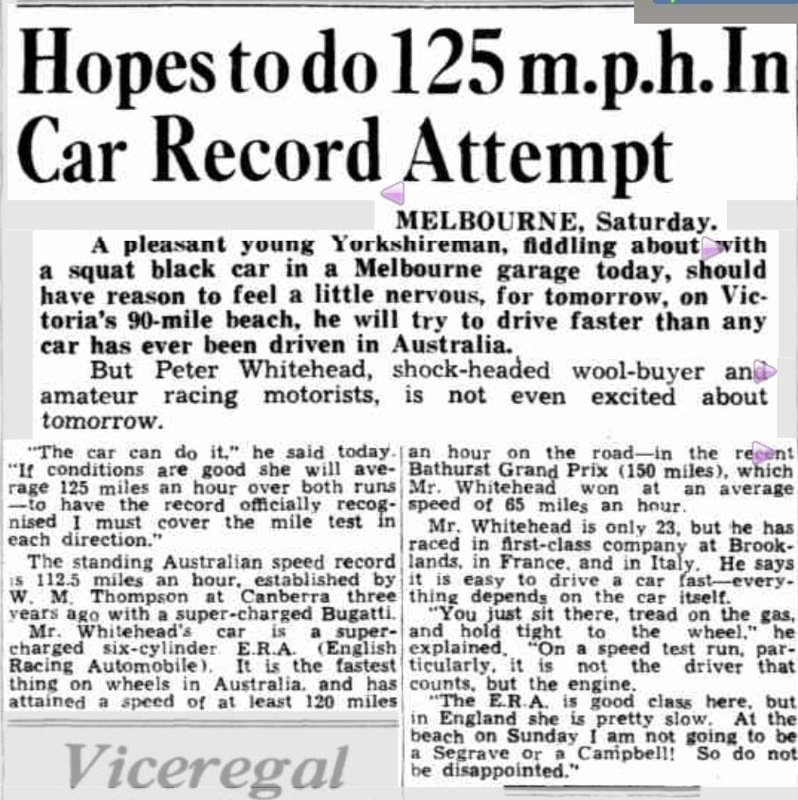 The ‘Melbourne Argus’ reported that 3500 people attended the pretty little hamlet and watched Whitehead clip 3.94 seconds off the previous record , his best time was 31.48 seconds winning both the Australian and Victorian Hillclimb Titles from Jack Phillips Ford V8 Spl and Arthur Terdichs’ Bugatti T37. The ‘Perth Sunday Times’ expected the Australian record of 92mph to be surpassed at the 90 Mile Beach, as the name suggests, a long expanse of coast at Woodside near Yarram 210 kilometres from Melbourne. 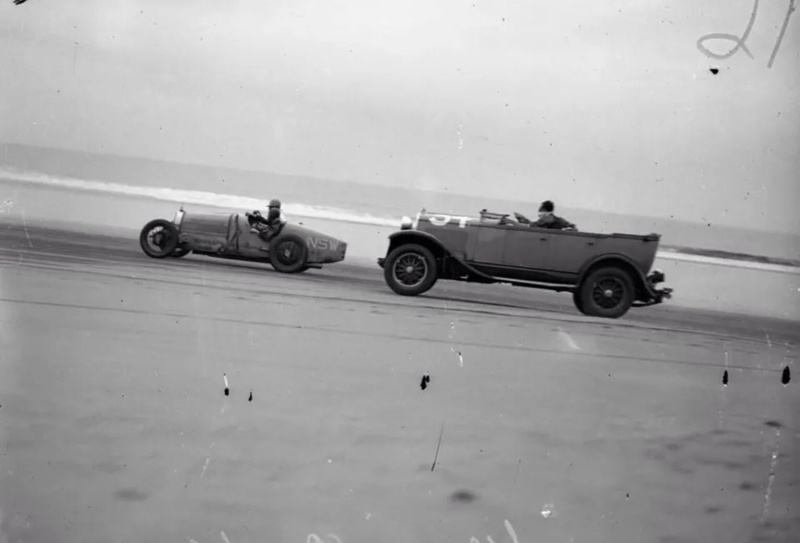 The attempt was made under the auspices and control of the Australian Automobile Association and a top speed of over 120 mph was expected over the 4 miles of pristine beach chosen for the attempts of Whitehead and others. 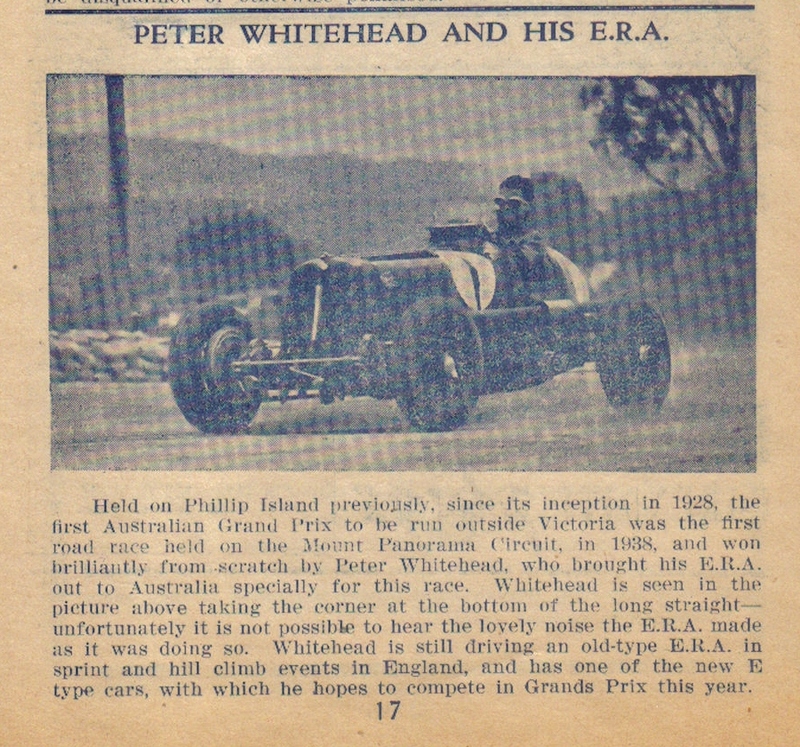 ‘The Adelaide Mail’ in its pre-event report described Whitehead ‘as a pleasant young Yorkshireman, a shock headed wool buyer and amateur racing motorist’. 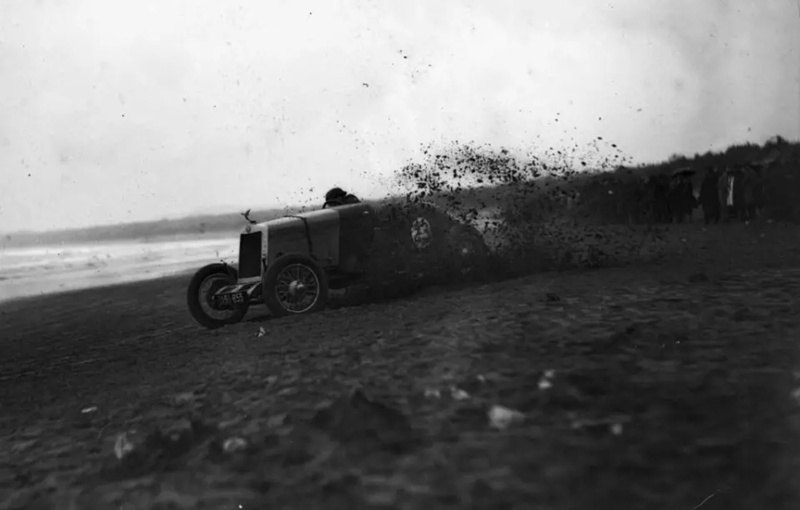 Whitehead was quoted as saying ‘ The car can do it if the conditions are good…You just sit there and tread on the gas, and hold tight to the wheel. On a good test run particularly, it is not the driver that counts but the engine. The ERA is good class here, but in England she is pretty slow. At the beach on Sunday i am not going to be a Segrave or a Campbell!! So do not be disappointed’. 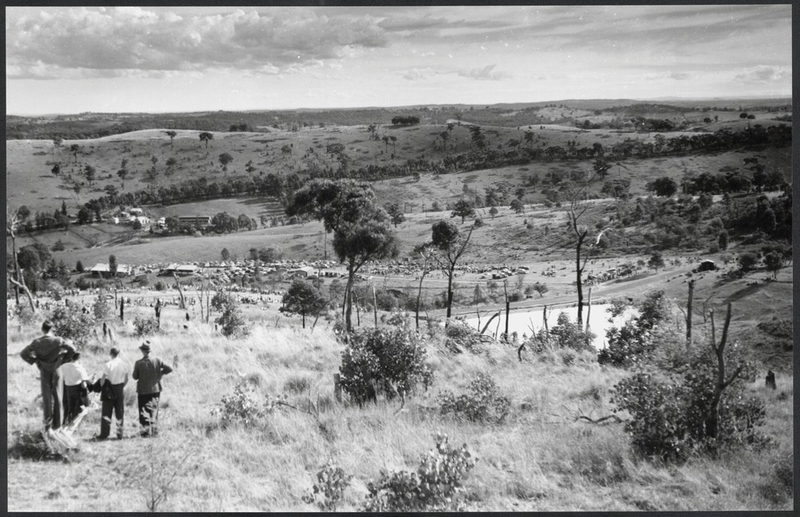 That 6000 people ‘conveyed by nearly 2000 motor vehicles ‘attended the event at the time is remarkable given the distance from Melbourne, the small local population and the lack of public transport to access the then relatively remote location. ‘The Melbourne Argus’ reported that the attempts were stymied by a strong south easterly wind which prevented the usual fall of the tide. After Whitehead achieved 118.8 mph in the ERA waves washed over the track preventing any further serious attempts. 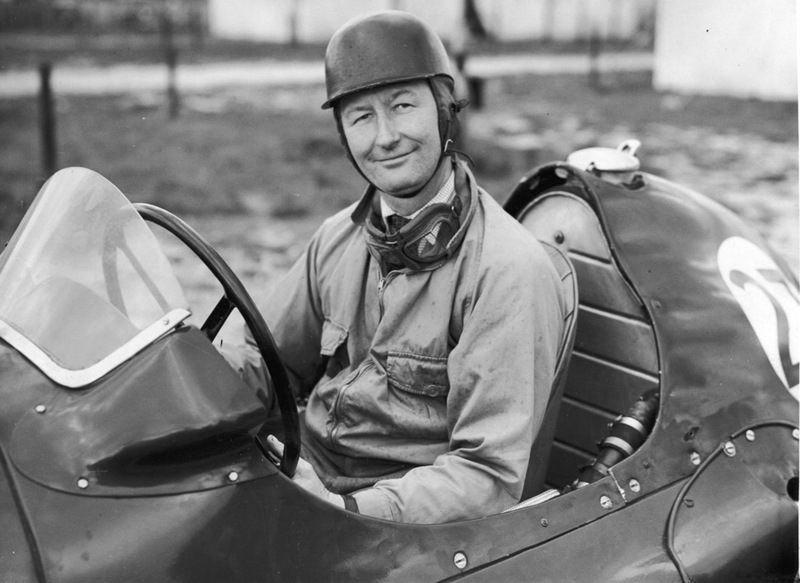 As Peters ‘ speed was in one direction, the rules requiring a two way average a new record was not recognised, the existing record set in Canberra some years before, by Bill Thompsons’ Bugatti, at 112.5mph remained. The report noted that Thompson was an interested onlooker. ‘The Sunday Times’ Perth 4/11/38. ‘With only a few yards of wet sand between the flags and the waves on the four mile course, Whitehead pluckily started up so as not to disappoint the crowd. 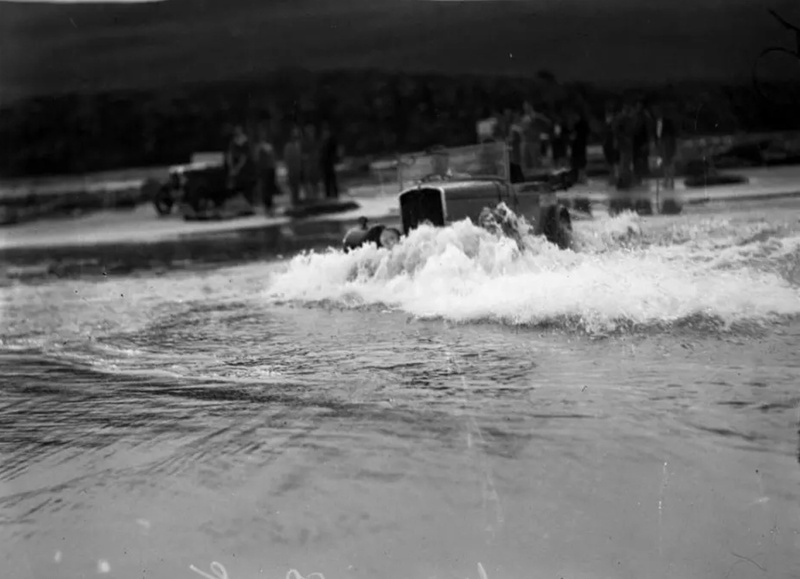 He was obstructed by water in his first run however, and although he averaged 118.8 mph in his next run, his car plunged through the lip of a wave, tearing away the apparatus for cooling the brakes, ripping off the oil filler cap, and partially flooding the crankcase with salt water. 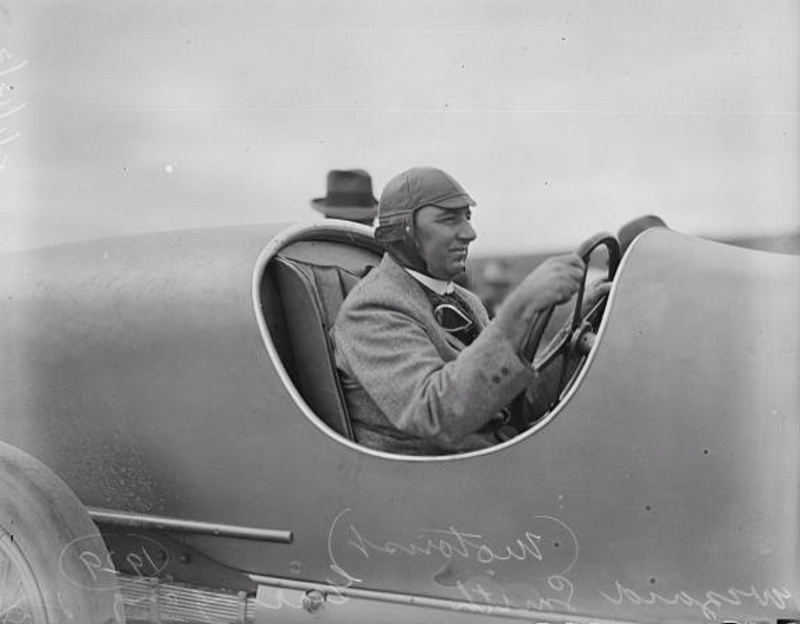 He maintained control but it was evident that he had no chance of putting the record up to 135mph which was his hope’. 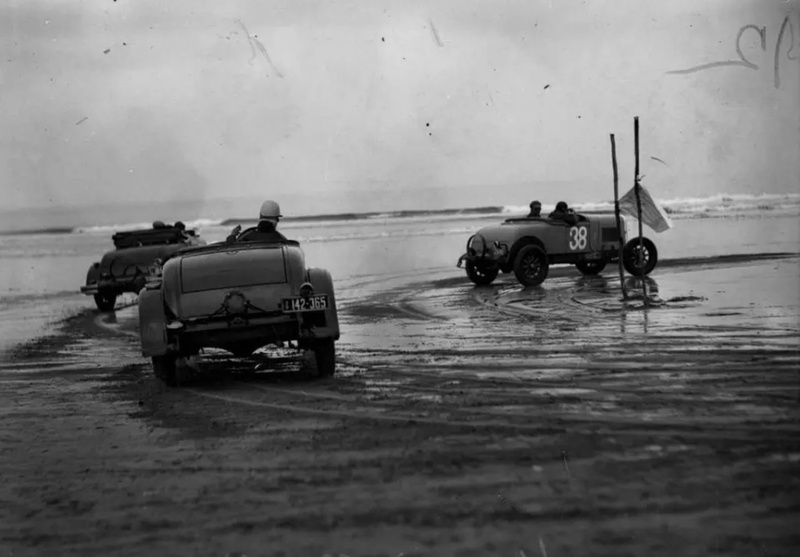 Officials decided to allow other drivers some runs whilst Whitehead attempted repairs but the day was abandoned ‘ with waves lapping the tent containing the electric timing apparatus and washing completely over the finishing point…there was a rush to get cars off the beach before the tide rose further’. In an indictment of the morals of the men of the day ‘The Argus’ on the same page breathlessly reported that ’55 men were arrested in Flinders Lane, Melbourne having been in a ‘common gaming house’, punting on the horses not allowed off course at the time! That Whitehead would run the car everywhere was shown again when he contested a ‘feature race’ at Aspendale Speedway in October. The venue was conceived as a horse racing track by James Crooke in 1891 but incorporated a track for ‘new fangled automobiles’ from 1906. 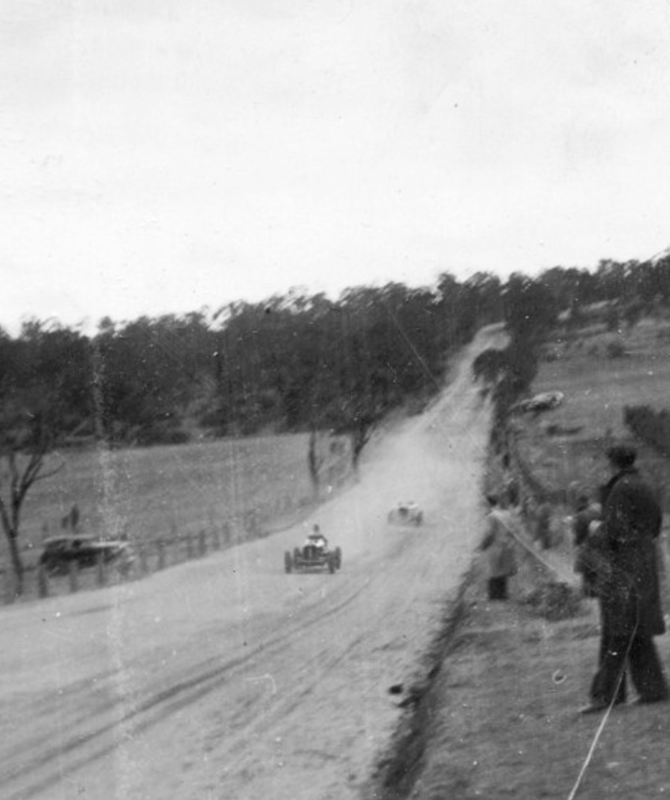 In fact one of the very first races in Australia was contested at the venue that year. Aspendale is a suburb 25 Km from Albert Park, also on Port Phillip Bay, which you can see from the AGP telecasts. 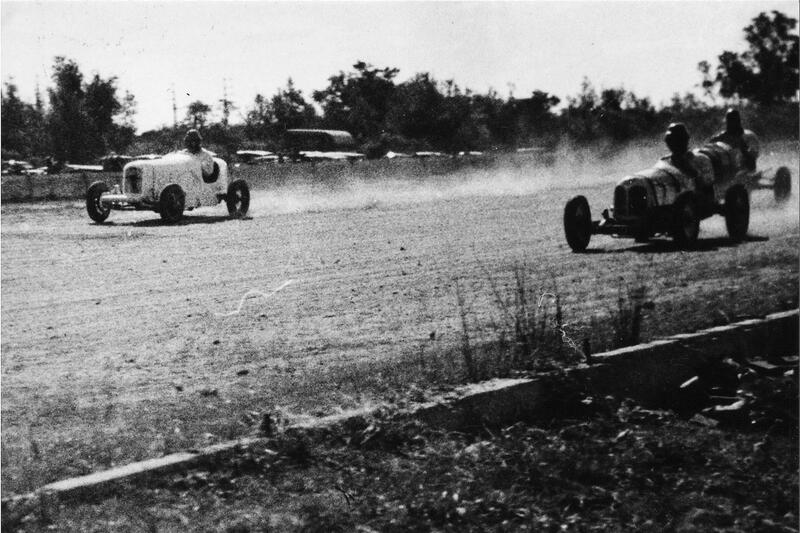 When built the facility was on Melbourne’s fringe but growing urban encroachment meant the track was subsumed for housing, the venue used for motor racing into the 1940’s. 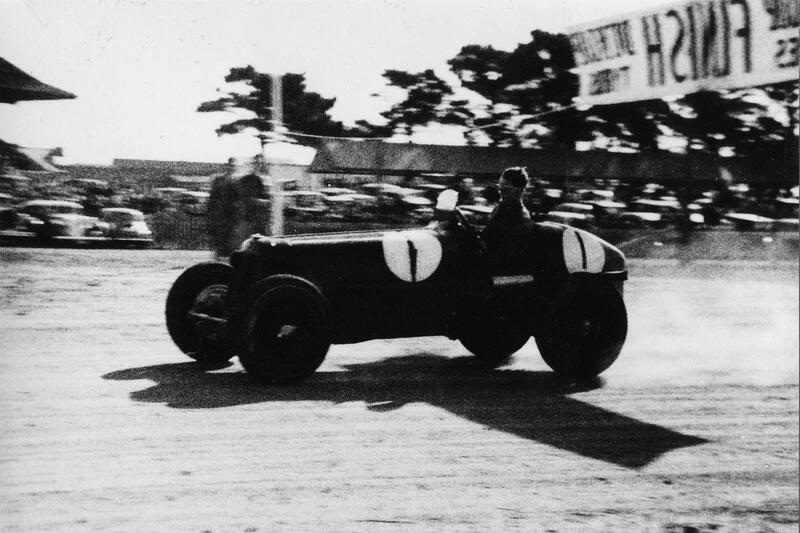 Whitehead won the feature from R Curlewis, MG and P Chain, Frazer Nash. It was the first time such an event was to be held in Sydney, a Grand Prix in Parramatta Park, an inner city suburb 25 kilometres from Sydneys’ centre. 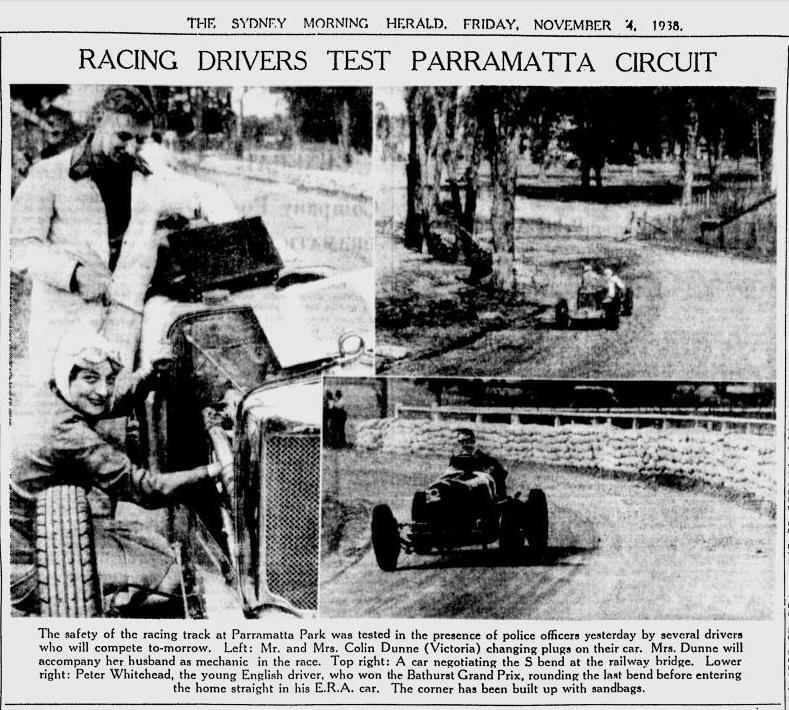 The event, conducted by the NSW Light Car Club and Empire Speedways was to be held on 5 November 1938, the finale of a series of events as part of Parramatta’s 150th Anniversary celebrations. Interest from drivers and the public was enormous. Twenty five entries were received including Whitehead, Frank Kleinig, Les Burrows and Hope Bartlett. 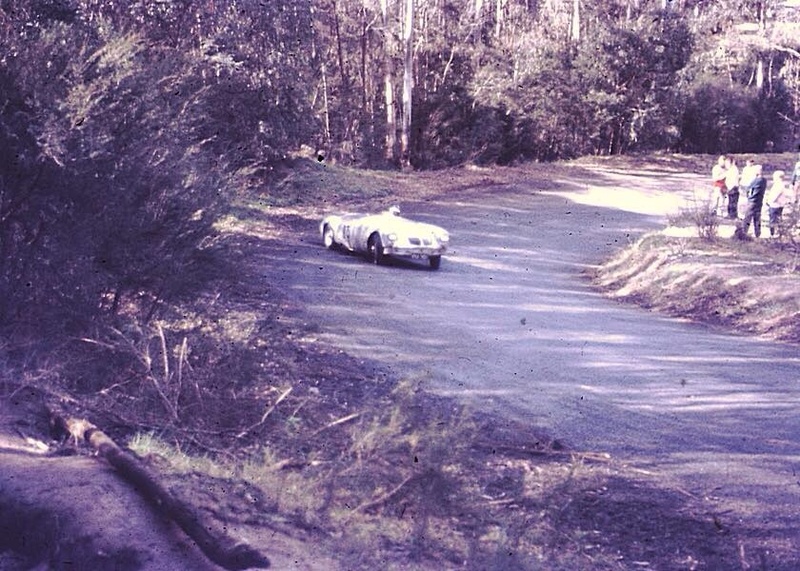 Jack Saywell’s Alfa Romeo and John Snow’s Delahaye, two of the fastest cars to have been brought into Australia were also set to oppose each other at the Parramatta Park track, described as being ideal with a good straight and challenging corners. 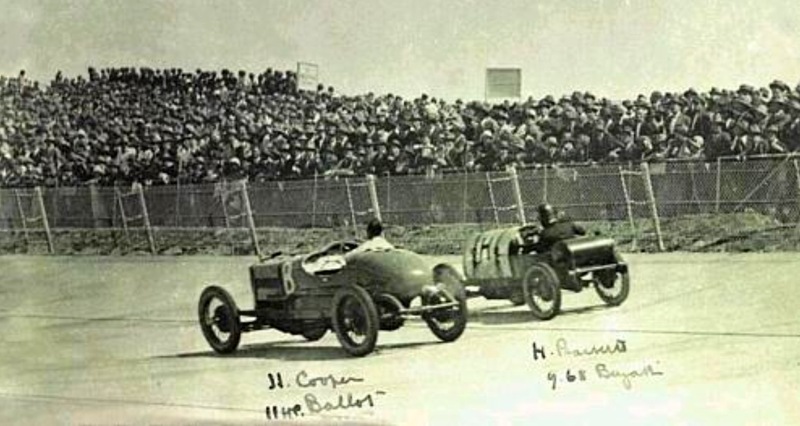 A grandstand with a capacity for 1100 spectators was built at the start-finish line, one thousand reserve tickets had been sold and about 50,000 people were expected to turn up to watch the event, which comprised 3 20 lap heats and a 50 lap final. Peter Arfanis wrote ‘However, all the excitement of the event was transformed to astonishment then fury by 5.30pm Friday 4 November. At the eleventh hour Police Commissioner Mr. MacKay decided to ban the race. The decision immediately caused an outcry with the Mayor of Parramatta, Alderman Irwin, calling for a public inquiry into the decision. Crowds had begun gathering on race day unaware that the race had been cancelled. It was a major disappointment for the people of Parramatta. The organisers were adamant that the race should continue and placed a fresh application for the race to be held on the following Saturday. Organisers were prepared to protect the public by erecting a ‘stout wire-meshed safety fence’ at any point that the police felt it necessary. The police stood firm stating that the track with its difficult bends would have been dangerous to both the public and the participants’. 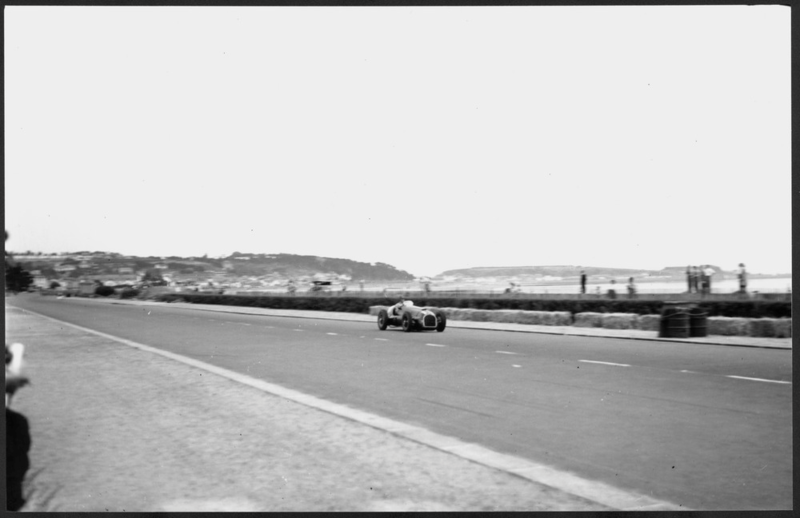 In practice Whitehead lapped the track in 1m 4.5 seconds ahead of Frank Kleinig (Hudson Spl) 1:7.6 and Jack Saywells’ Alfa P3 1:9.0, the circuit 1.1 miles long. 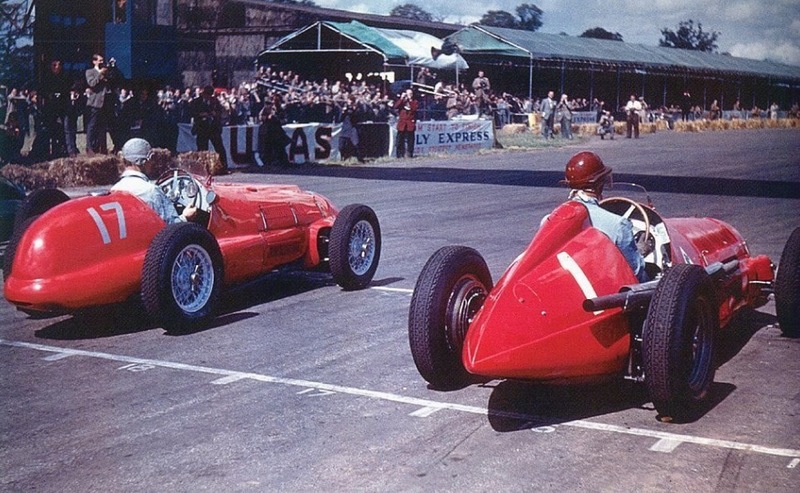 Several events were run post war; Stan Jones did 1.01 in Maybach 1 in 1952 and Jack Brabham 59.5 in his Cooper T23 Bristol in 1954 with no quicker car beating his time at the final meeting in the Park in 1955. 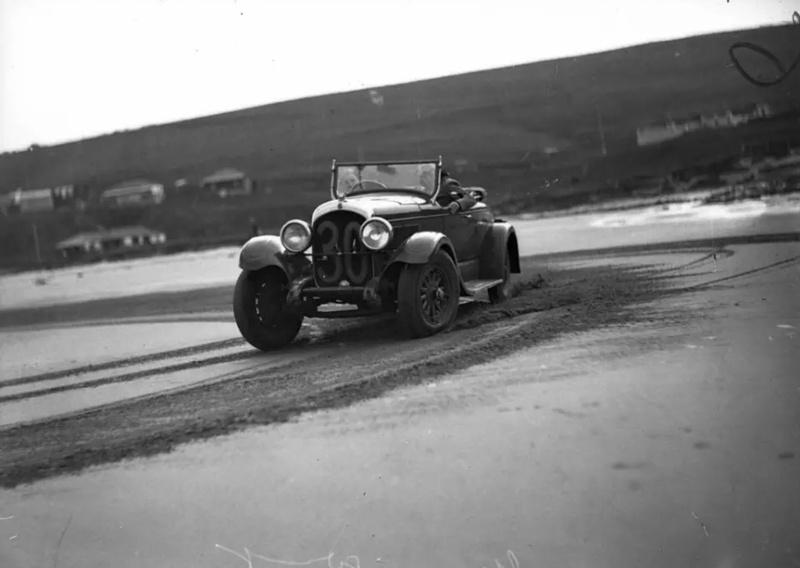 ‘Seven Mile Beach’ became known as the Gerringong Speedway, it was a popular outing to attend the races, and was the scene of a significant event in Australian motor sport history when the 100 miles per hour barrier was broken. 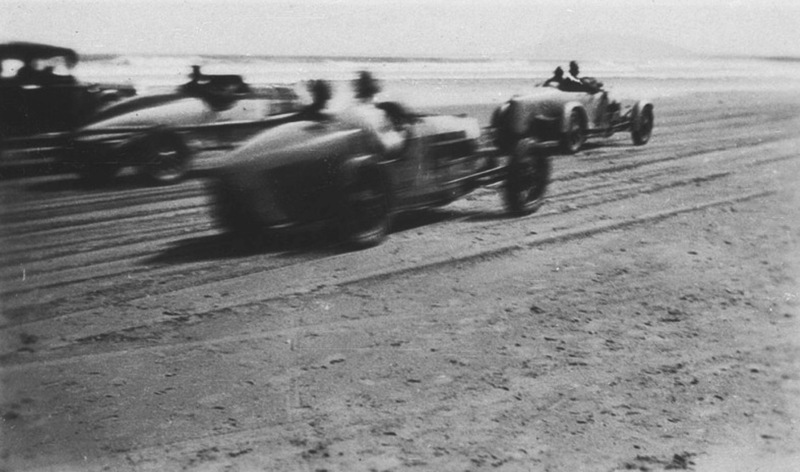 There were regular races throughout the 1920’s and early 1930’s. 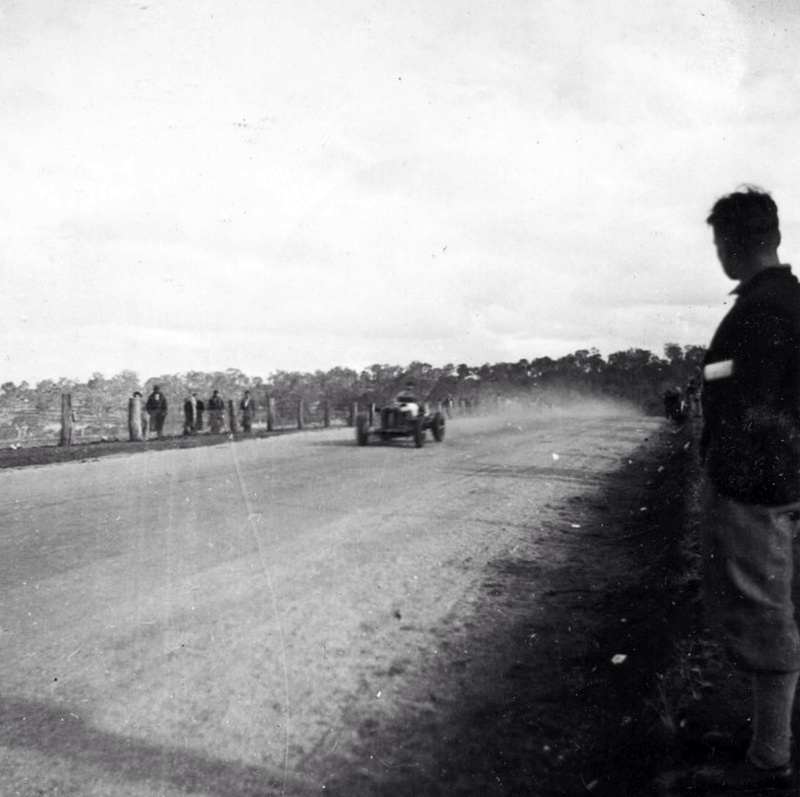 Around 2000 spectators were present at the Royal Automobile Club speed trials in March 1925, hoping to see the 100m/h barrier broken. Don Harkness did so on October 7, 1925. 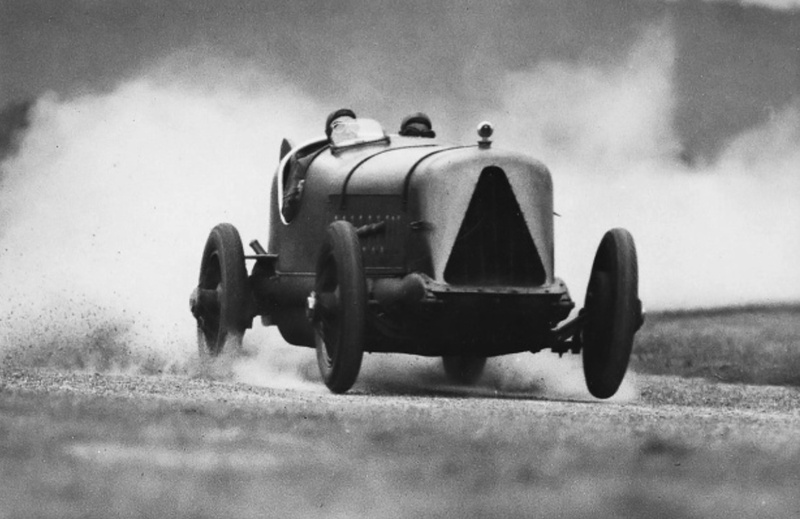 His official speed was 107.75mph in a Hispano-Suiza V8 powered Minerva. 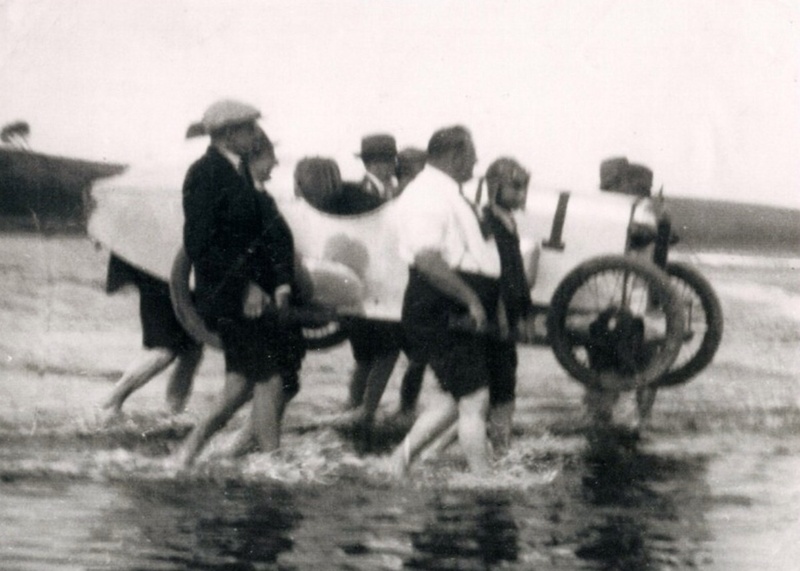 The crowds were excited by the car racing and land speed trials on Seven Mile Beach but in 1933 an entirely new era of transport began there. Local cars used their headlights to provide extra illumination for the first commercial flight between Australia and New Zealand. 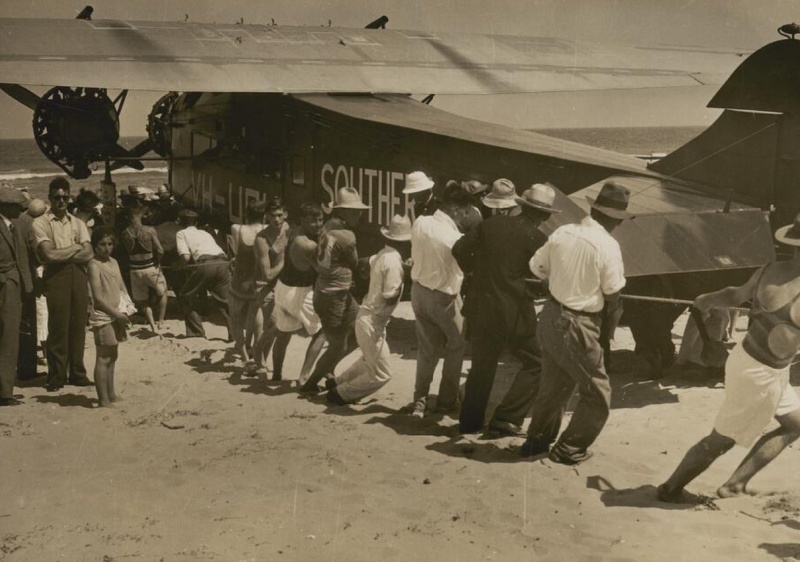 Sir Charles Kingsford-Smith used Seven Mile Beach as the runway for this flight between Australia and New Zealand and several thousand people came to watch the 2:30am take off. It would be interesting to know who rebuilt the engine in Oz, or perhaps he had a spare, probably did given the professionalism involved. I’ve not been able to ascertain exactly when Whitehead shipped R10B back to England, he travelled via South Africa on the way home. 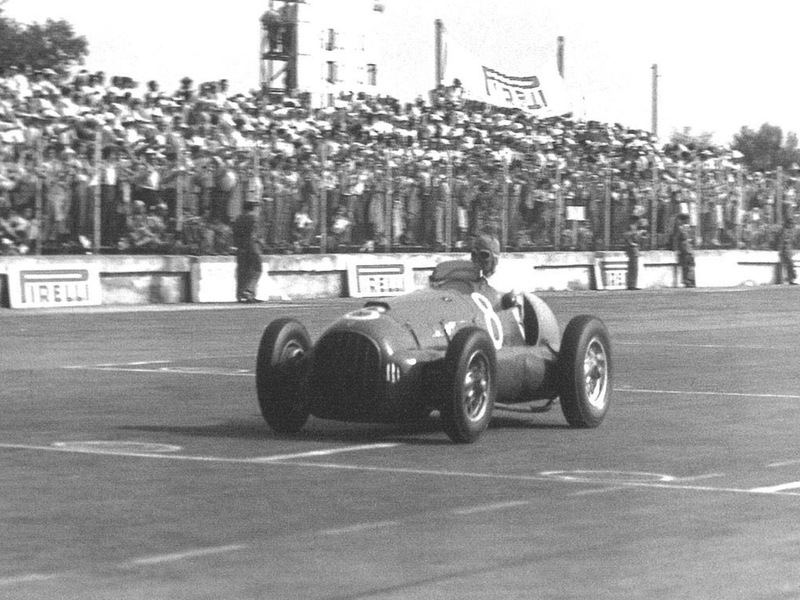 R10B contested 2 races, DNF with piston failure in the 5th South African GP at East London on 2 January 1939, the race was won by Luigi Villoresi in a Maserati 6CM. On January 14 he raced in the Grosvenor GP at Capetown again suffering piston failure, Franco Cortese won in another 6CM. 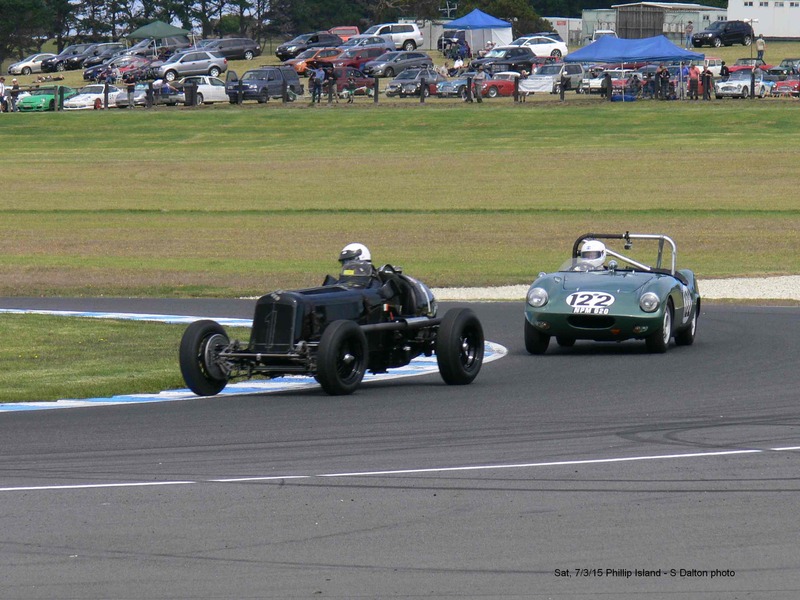 1978 was the 50th anniversary of the first AGP held on the dusty public roads of Phillip Island in 1928, fittingly there was a fantastic weekend of celebrations to recognise what is one of the oldest continuous Grands’ Prix in the world. 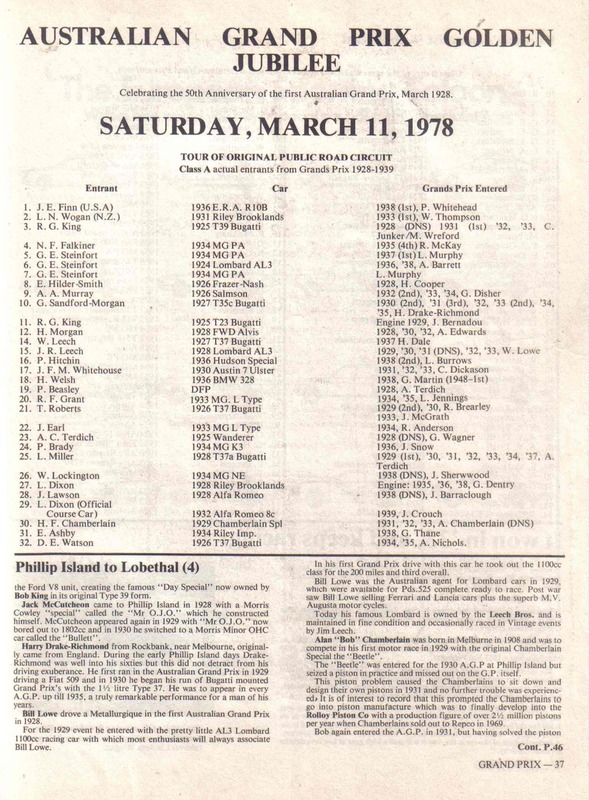 A championship event only since 1985 granted, but a GP with a long history all the same. I was a young university student at the time and camped there for the weekend, the Phillip Island circuit had not long since been reopened, in addition to the re-enactment runs on the public roads there was a fantastic weekend of historic competition bringing together many of the cars which contested the event, including the 1938 victor, R10B. At the time the cars custodian was Joel Finn, he provided a great demonstration of the sight and sound of these fabulous cars. The current custodian of the car Paddins Dowling raced in the Phillip Island Classic in 2015, Stephen Dalton took these shots of the car. Stephen Dalton, enthusiast/historian for the advice, photos, sourcing some of the references, and ‘post posting’ errors detection! 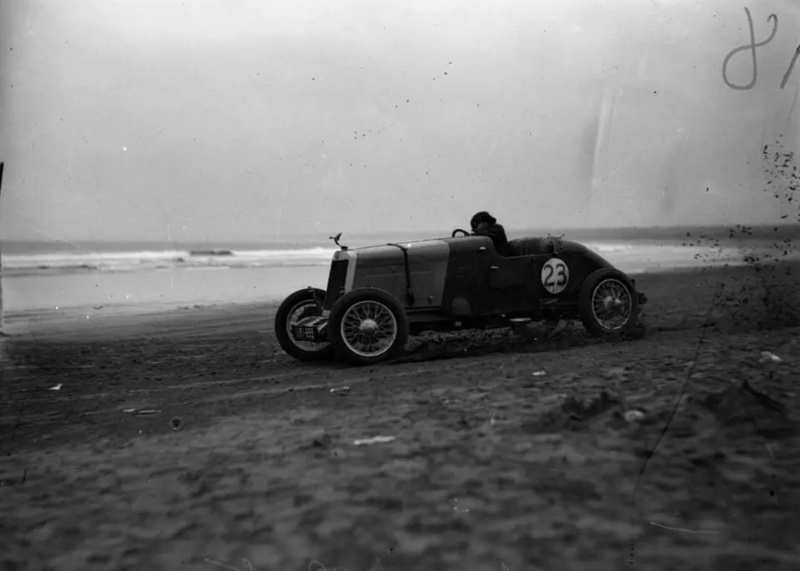 Martin Stubbs of the Dacre Stubbs Collection for securing the use of the 90 Mile Beach and Aspendale Speedway images of the late EH Price from the Collection of John Hazelden. Thanks Martin and John for the use of these rare images.